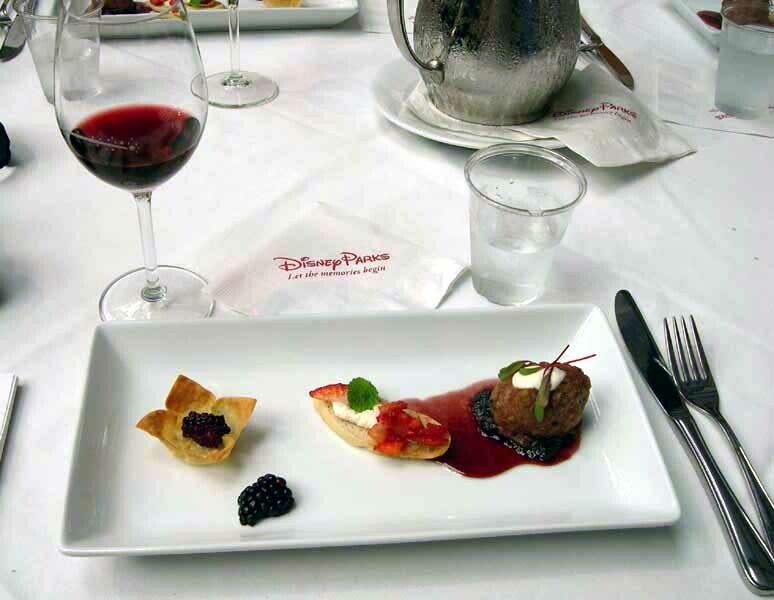 We knew our next trip should include the Food & Wine Festival. Due to our schedules and other commitments we could only head south for the last few days in October and the first two weeks in November. 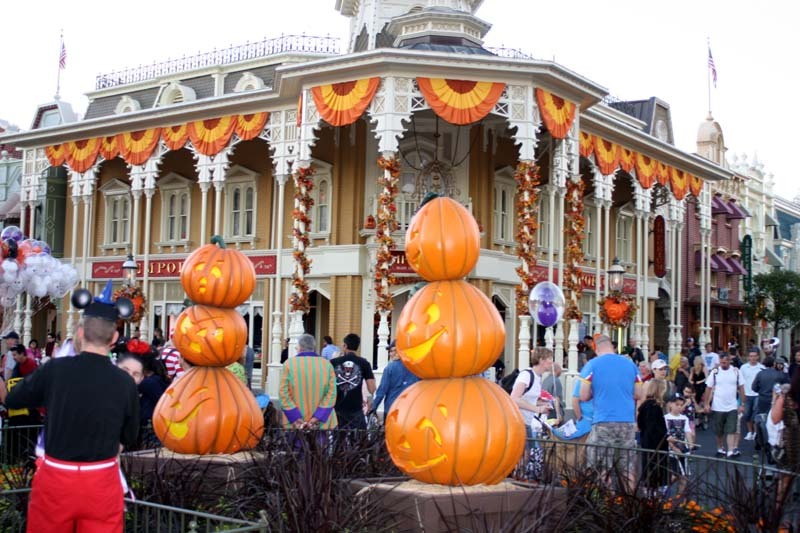 Kelli wanted to celebrate her birthday at home and we wanted to be home for Halloween so we booked a studio at Saratoga Springs Resort from Sunday November 4 to Saturday November 10. 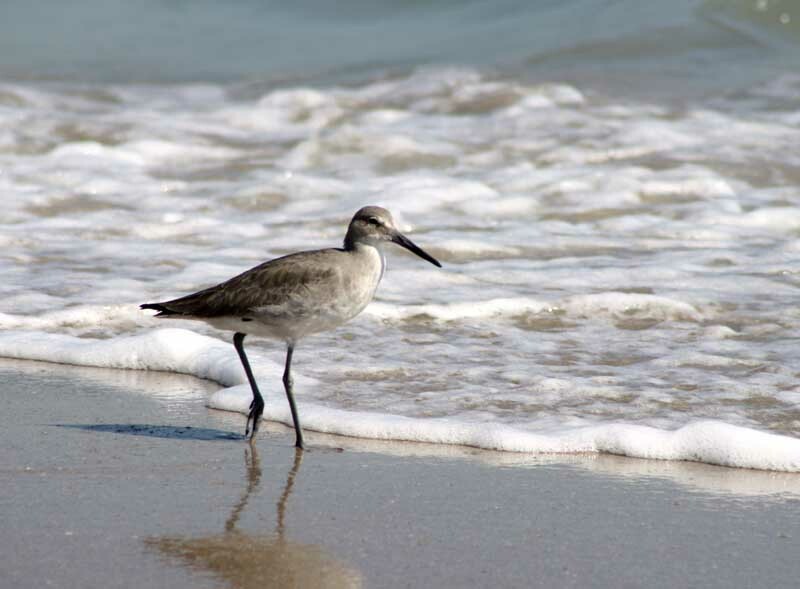 We planned on visiting friends on the coast on the weekend we arrive or the weekend we leave. What we didn’t know was that it would be Jersey Week – when, due to Election Day, a two day conference for teachers and Veterans Day weekend – many New Jersey families head down since they can take a week off and the kids would only miss a couple of days of school. This led to many unavailable flights or very high airfares. Since the difference in airfare for arriving on Thursday would easily pay for additional accommodations for the 3 extra nights we book Delta leaving LaGuardia Airport in NY on November 1. To get the cheapest airfare would also mean arriving back at a different airport, JFK on Saturday the 10th. 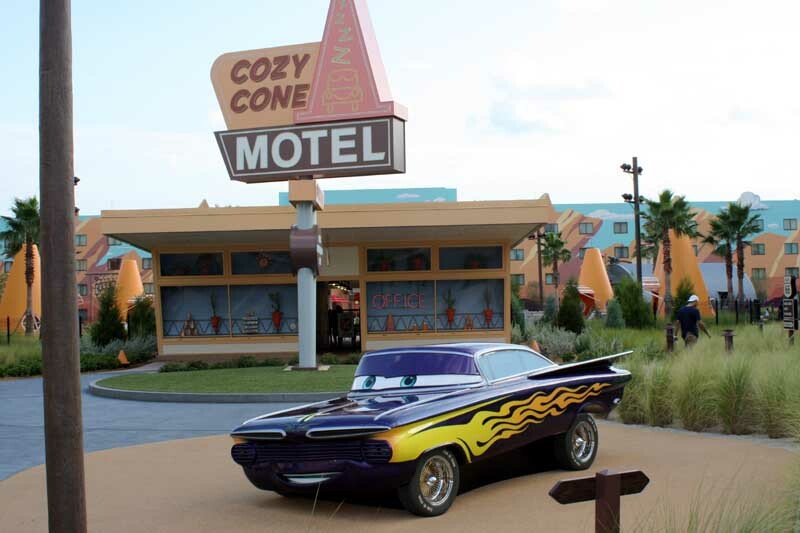 We booked Thursday and Friday night at Pop Century (annual pass discount) and the Saturday at a Holiday Inn Express in Melbourne, Florida (AAA rate). 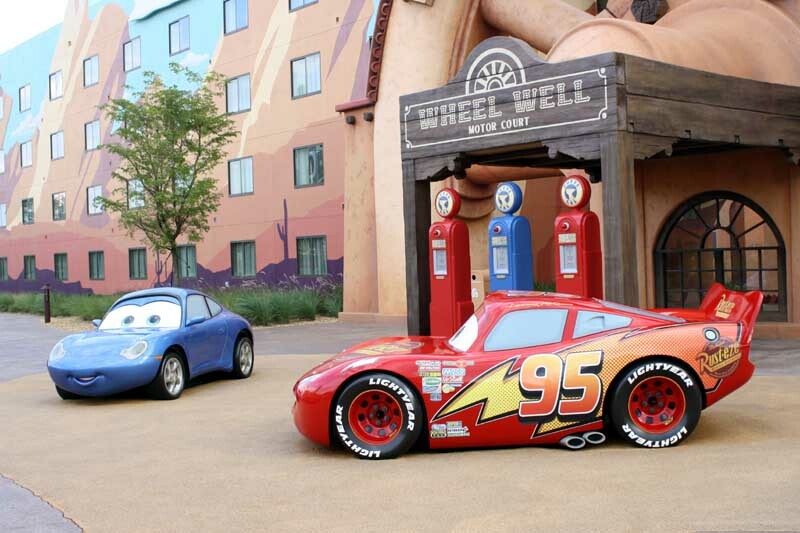 We will use Alamo for the first time – since the best deal was the DVC discount with them. 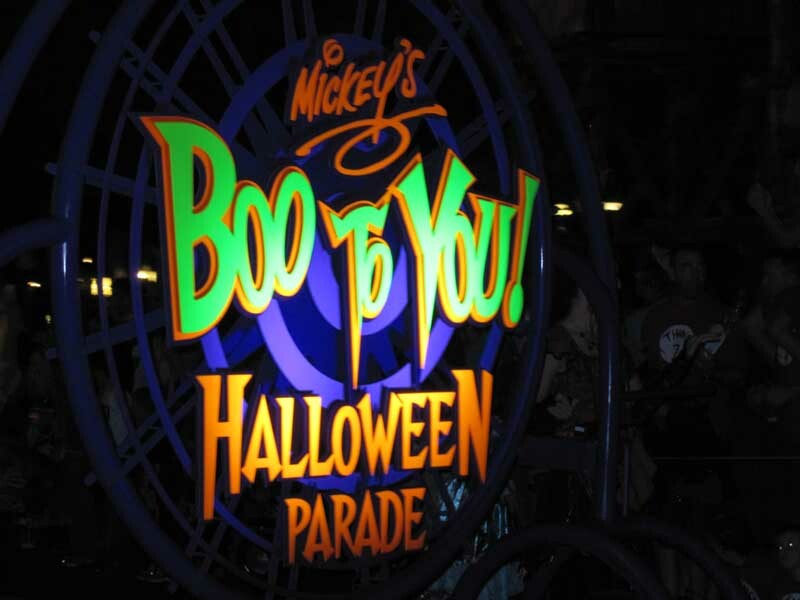 Another perk on arriving on the first is that we could go the last Mickey’s Not So Scary Halloween Party on the 2nd and enjoy Mickey’s Very Merry Christmas Party on the 9th. We also paid for reservations for two Culinary Demonstrations: Wendy Bazilian and Jon Ashton, Driscoll's Only the Finest Berries (Turkey) and Cristobal Lopez, Portobello, (Pork). 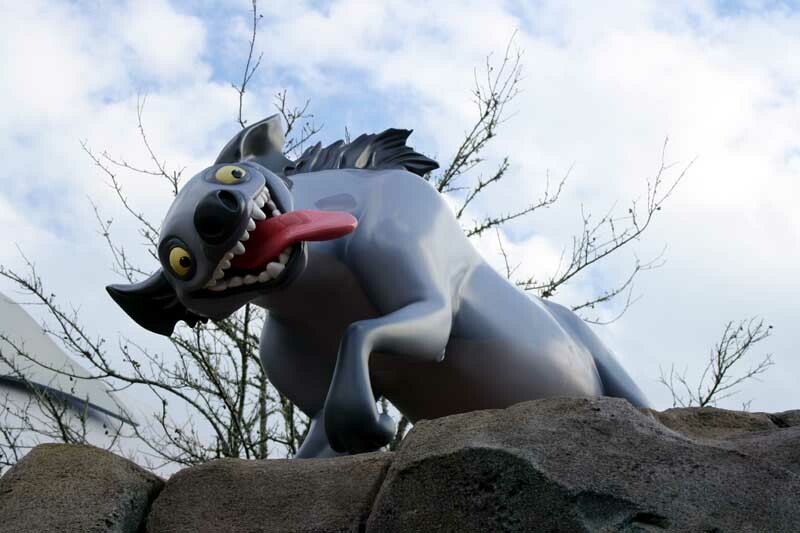 And lastly we signed up for one of the DVC member previews for Fantasy Land. Kelli wants to relax more on this vacation, - so little park storming for us – but as usual I may get up early and ride thrill rides at opening while she sleeps in. Another wonderful surprise was that Kelli decided to take swimming lessons – now we can both enjoy the pools together. And yes, I know the pools are only 3 – 4 feet deep in most areas, but this has relieved a lot of the apprehension she had. I’m really looking forward to that. A week before leaving we heard that Hurricane Sandy will be heading our way. On late Monday October 29 the storm hit. The winds were incredibly powerful and our lights flickered for hours. Oddly we did not have a lot of rain, less than 2 inches. We saw the power lines arcing across the street, sending sparks to the street and lighting up the night sky but somehow our power never went out. Our arbor tipped over in the yard but the house had no damage. We were very lucky, many other people were not. Kelli’s work was closed Tuesday but they got power back and she went in Wednesday. My work place in northern New Jersey was hard hit and I did not have to go to work Tuesday and Wednesday since they had no or limited power. (I latter learned that my work was without power for ten days!). On Tuesday we found out that Delta had cancelled our Thursday morning flight. LaGuardia Airport was under water! 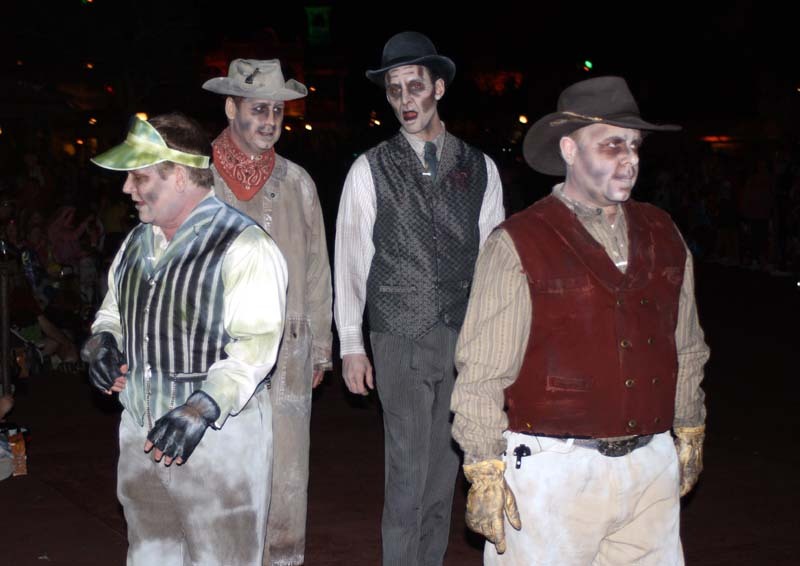 They rebooked for Friday night; we would miss the Halloween party and lose 2 days of vacation. I re-booked it so we could get in Friday evening, missing half the party. Not happy I re-rebooked it from a small airport north of us going from NY to Detroit to Atlanta then to Orlando, but we would get in by Friday afternoon. On Wednesday night we heard on the TV that LaGuardia would partially open the next day (Thank God we had power!). I was then able to re-re-rebook the flight out of LaGuardia on a direct flight AND it was the same time as our original flight that was cancelled! We then had to quickly finish packing and hope the flight would leave the next morning. We woke up early and our niece and nephew picked up us for the short ride to LaGuardia Airport. The airport wasn’t busy at all. They were officially opening at 7AM after being closed for three days. We tried to check in curbside but the porter said he could not check us in and to see the inside counter. This didn’t look good. Only one person was in front of us and after a short wait there was no problem checking in and getting our boarding passes – whew! The line at security was non existent and we made it through in record time. While we waited at the gate we noticed a number of Delta employees lining the exit to the gate across from us. They were celebrating the re-opening of the airport by cheering on the arriving customers of the first arriving planes. Nice touch. Our flight was only 40 percent full, not surprising since the news just announced that the airport was reopening the night before. Many people don’t have power anyway so they wouldn’t have known to check. The flight down was smooth and uneventful and our luggage was waiting for us at baggage claim. We made our way over to Alamo. We chose Alamo this time due to the DVC discount we got from them. We were next in line with about 5 representatives taking care of customers and thought the wait would be short, WRONG. Now I remember why I like Enterprise better. The clerks do a hard sell with everyone trying to up sell everything, gas, insurance, upgrades, GPS etc. When it was my turn I was firm and polite and was quickly on our way. Our first stop was the Disney's Character Warehouse in the Orlando Premium Outlets on Vineland Avenue, a short distance from Downtown Disney. 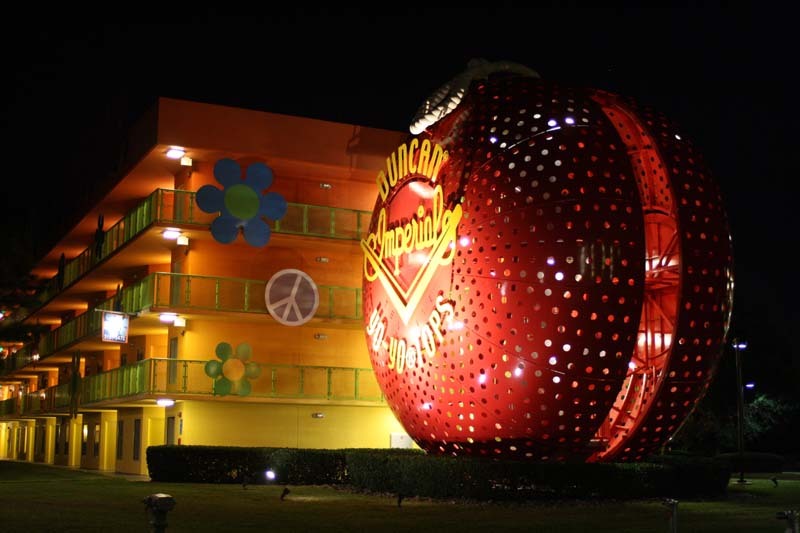 We found some bargains on T-shirts and vinylmations and we were on our way to the Pop Century Resort. We decided to have lunch at the Everything Pop Food Court before checking in. We had the Mediterranean Flatbread and the Beef Chimichurri Burrito. 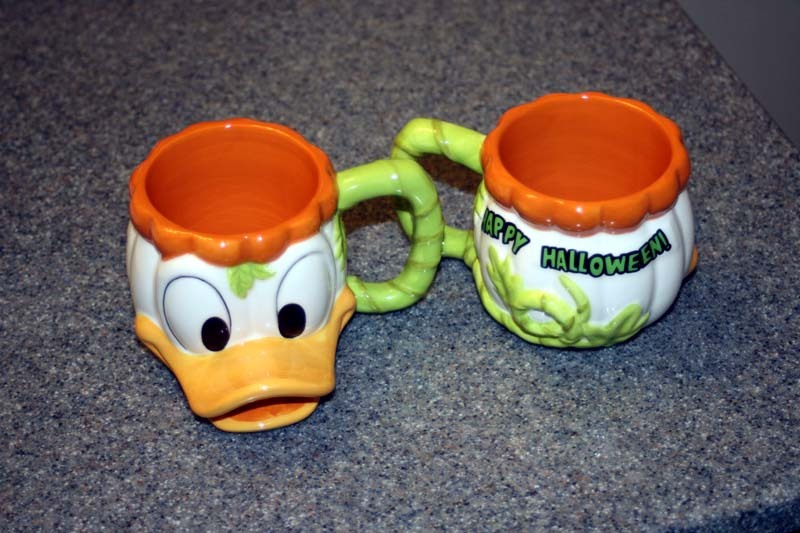 Kelli also wanted a new refillable mug. We remembered that the Tables in Wonderland card gives the 20 percent discount here. We checked in and were in the 50’s section, facing the 60’s section. 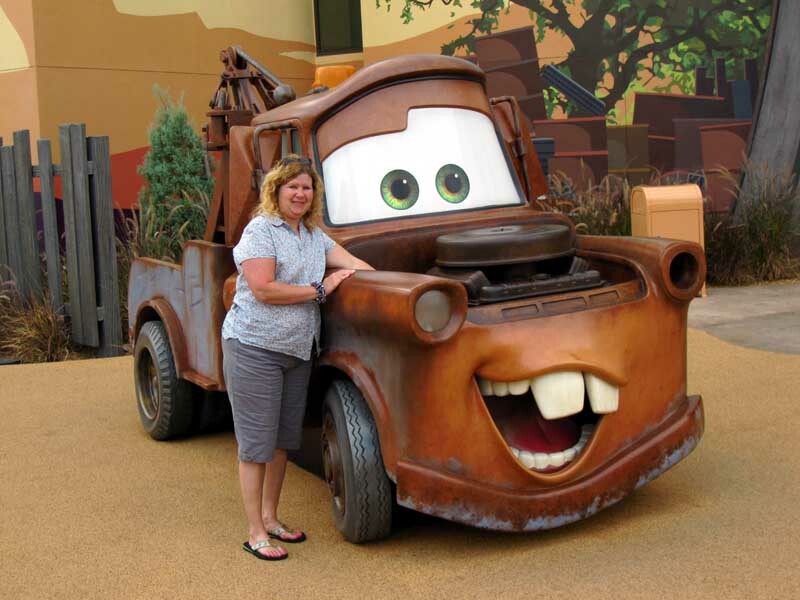 I turned on the TV and watched Must Do Stacey while unpacking . . . . Oops, Freudian slip; I mean Must Do Disney with everyone’s favorite host Stacey. 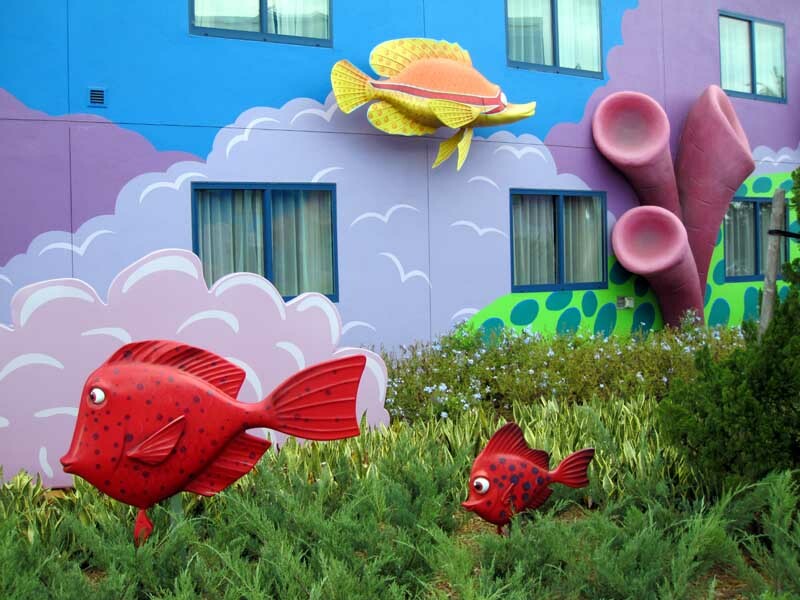 After resting a bit we walked to Hour Glass Lake and across the Generation Gap Bridge and into the new Art of Animation Resort. 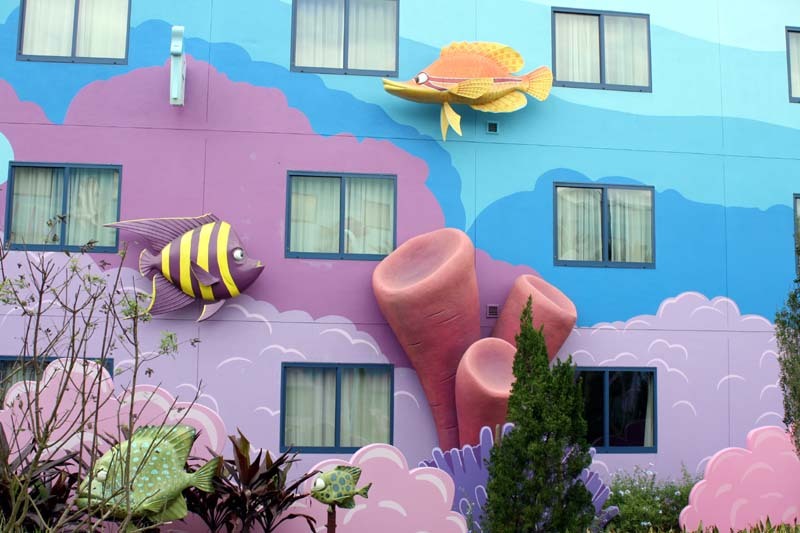 We were immediately impressed by the varied and colorful 3-D fish adorning the Finding Nemo buildings and surrounding flora. 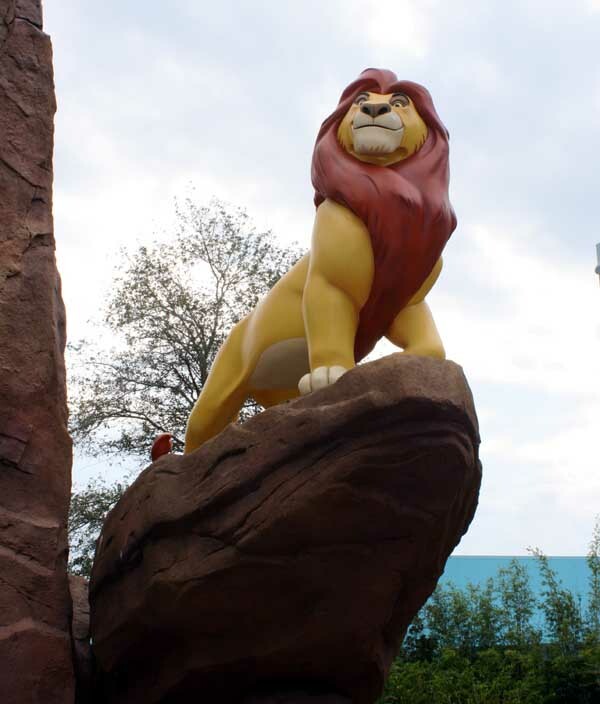 We then explored the Lion King section. 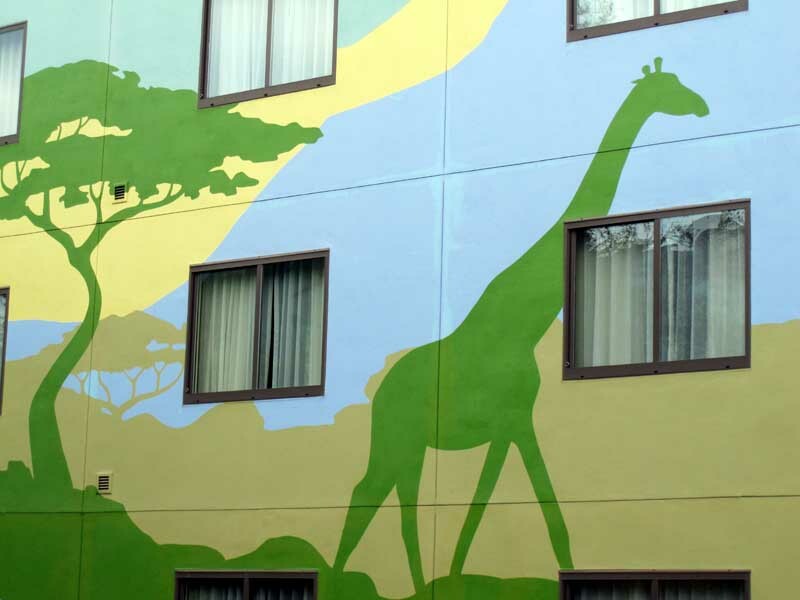 I really liked how the middle section looks like an African savannah. 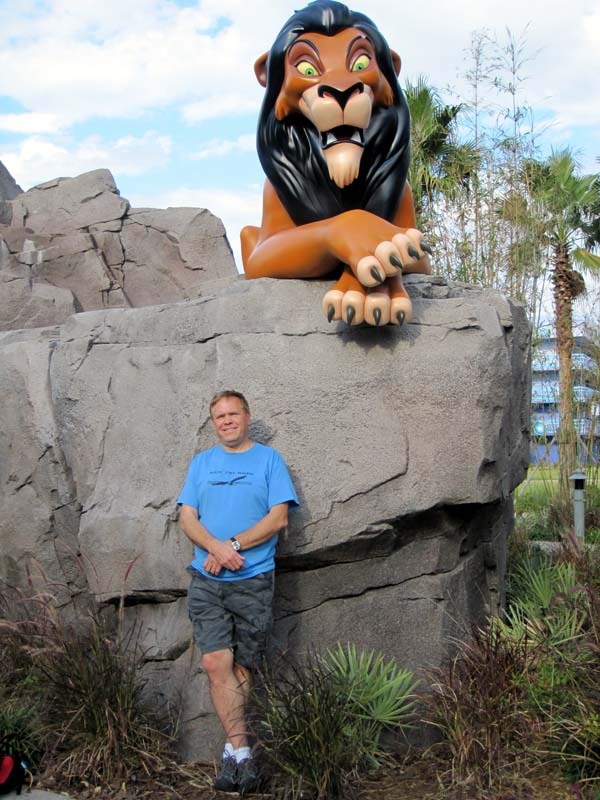 All the characters from the movie were represented and I positioned myself beneath Scar, posing in a similar manner. 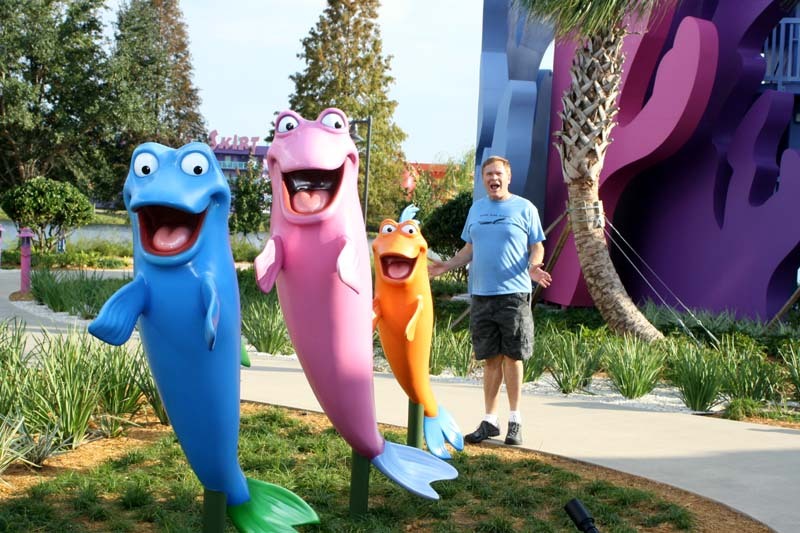 Next was The Little Mermaid section where I posed as one of the lined up fish. 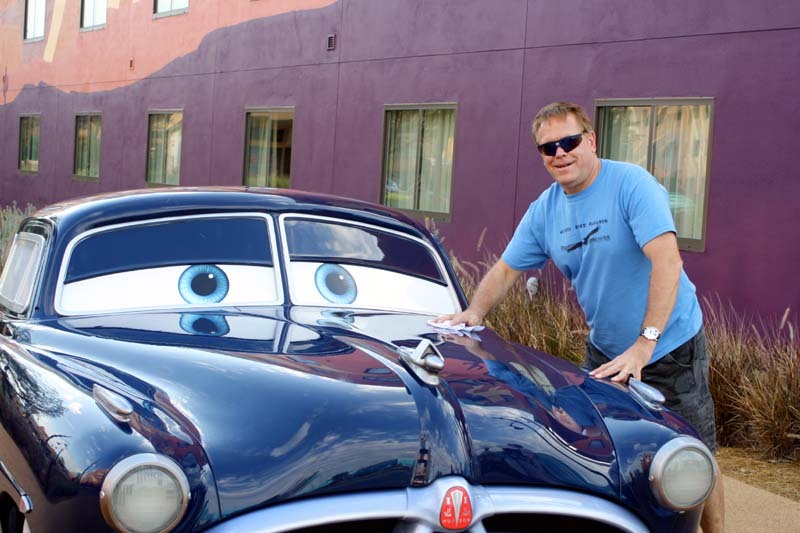 We back tracked to the Cars section where I posed as if I was waxing and buffing Doc Hudson. 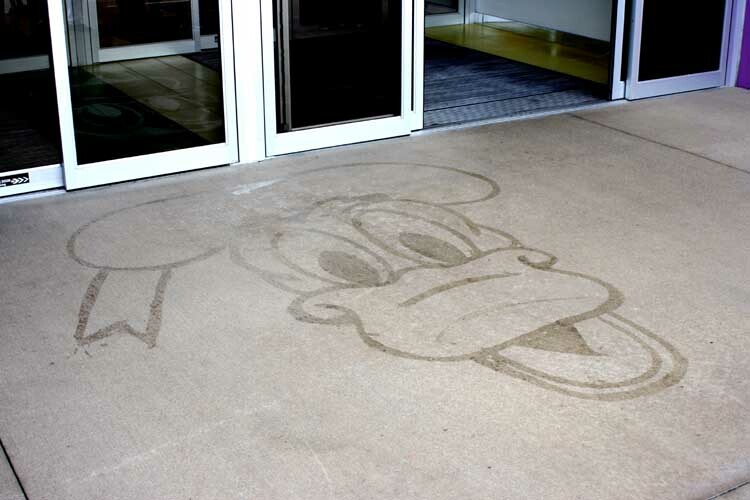 Outside the main building a cast member was drawing on the sidewalk with water. We decided to eat at their food court, Landscape of Flavors. We split a Kids Macaroni and Cheese and a Surf and Surf Burger - Crab Cake topped with fried popcorn shrimp, tomato, lettuce, and Cajun reoulade on a brioche bun with house-seasoned fries. The crab cake overwhelmed the shrimp. I would suggest eating the shrimp alone then eating the rest as a crab cake sandwich. Next was the obligatory shopping in the Ink and Paint Shop. 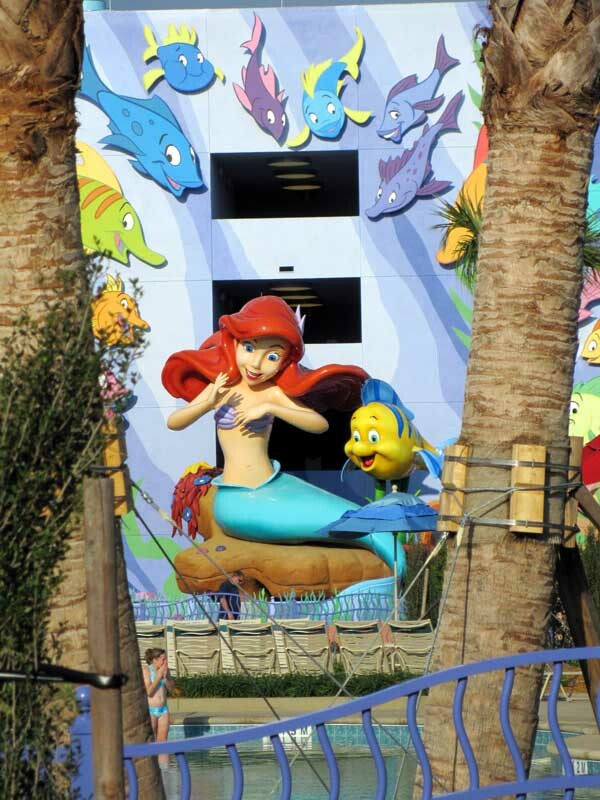 It looked like they had a fair amount of Ariel merchandise; we’ll have to let our niece know. We grabbed Gelatos that came with a souvenir Donald Duck Halloween cup and enjoyed them on the other side of the bridge as the sun was setting. 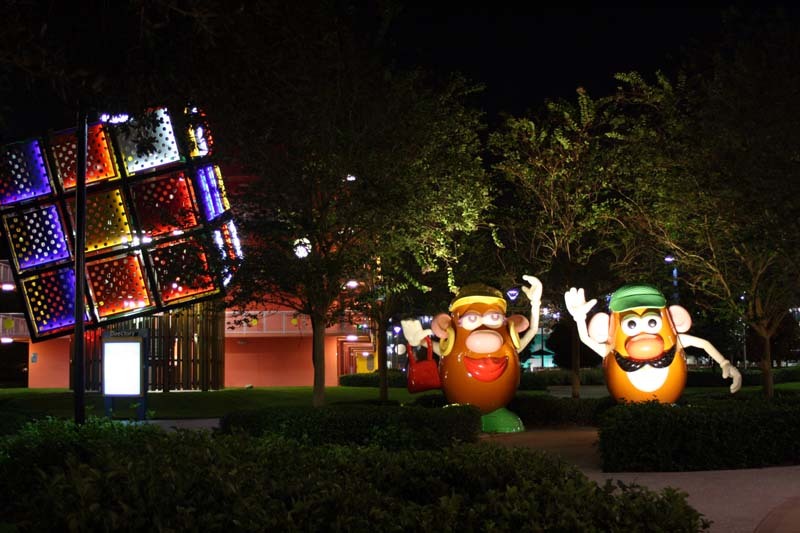 Our last venture was a quiet and romantic walk around Pop Century at night, mainly along the lake where I tried to take some night shots of the resort. We also stopped in the food court for a late night snack, a cookie and the kids meal mac & cheese. We had a terrific day. It was great to escape from NY and the chaos. 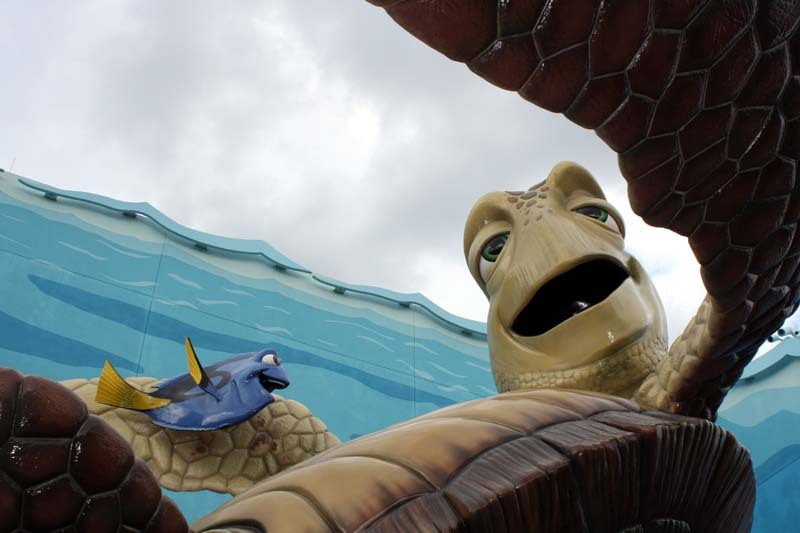 We were very impressed by the Art of Animation Resort. It seems like Disney does not rest on it laurels. 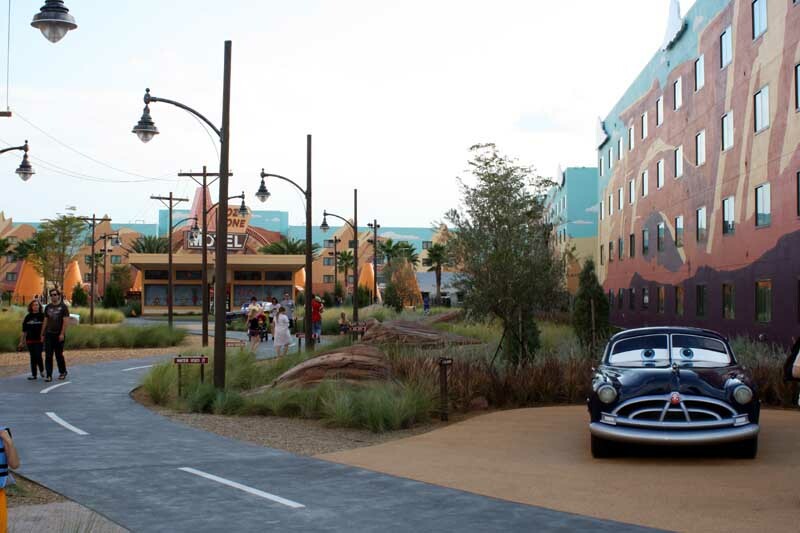 Each new project/attraction/resort outperforms the last, even if it’s a “value” resort. We slept in so we were sure to be rested for the Halloween Party later tonight. Breakfasts at the food court were pancakes and waffles with bacon. 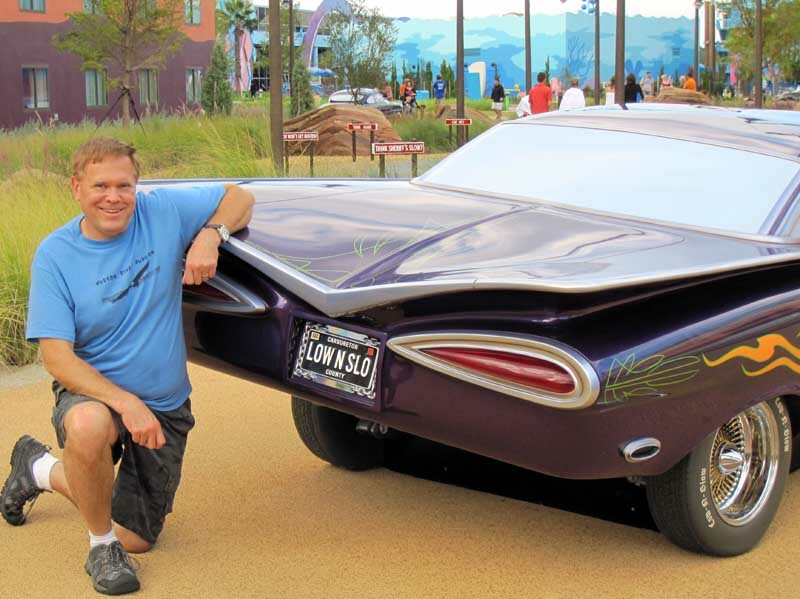 Then it was off to Epcot by car. 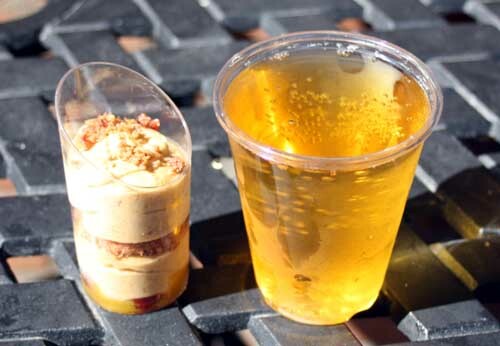 First was the coffee stand near Innovations East for some real coffee, then onto Epcot’s International Food & Wine Festival Center. Some demos were taking place and we stopped and listened for a bit. We also perused the gift shop areas but decided to come back and buy on the way out. We stopped by the Cranberry Bog and chatted with the lady standing in the bog (did not jot down her name!). She was great in explaining the way they are grown and harvested. Nearby they were handing out packets of Ocean Spray Craisens, one of our favorite snacks; they’re great in salads too. The watermelon patch near showcase plaza explained how to pick a ripe watermelon, useful since I just successfully grew a few in the back yard this year. It was just after 11 AM and the World Showcase had just opened up. This is the way to do the food and wine festival, on a weekday, just after opening. There were short or no lines everywhere and were able to quickly sample a number of items. We went clockwise and were full halfway around. We then made notes on what to get on the next visit. 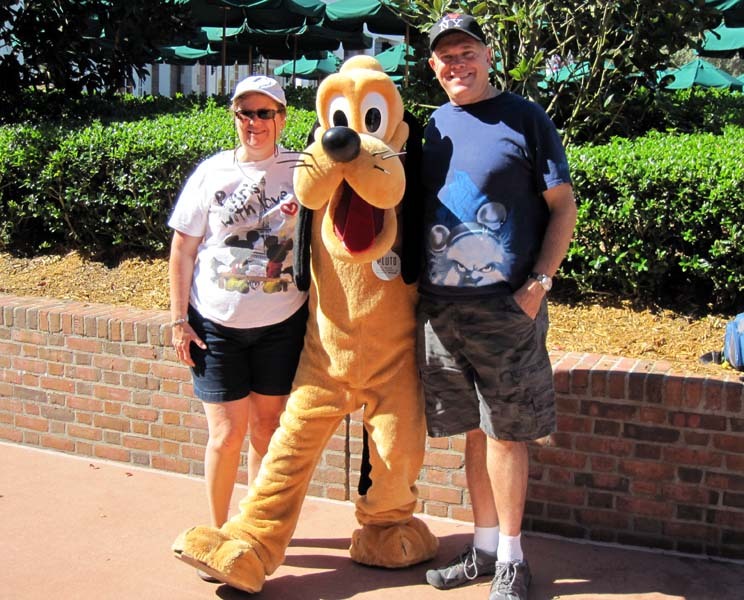 We also took our time exploring the miniature train set near Germany and we took pictures with Pluto since there was no wait. Next was back to the festival center to shop. We also visited the Chase lounge where it was great to sit and relax a bit with some free soda to rehydrate as well. 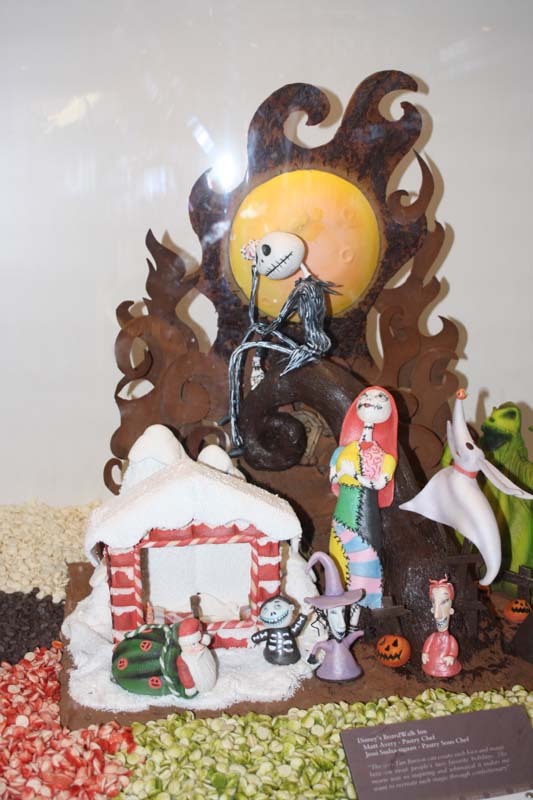 Just outside of the lounge they had a fabulous display of chocolate molded into elaborate scenes. 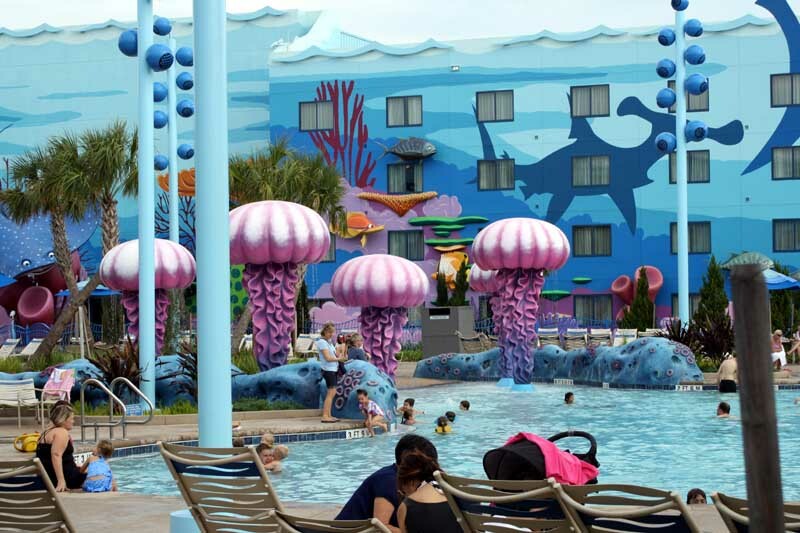 We headed back to Pop Century and headed down to the bowling pin pool. Kelli is taking swimming lesson and did great practicing. It is wonderful that we now can enjoy the pools together. We had a 5:20 PM ADR for the Kona Café at Disney's Polynesian Resort. 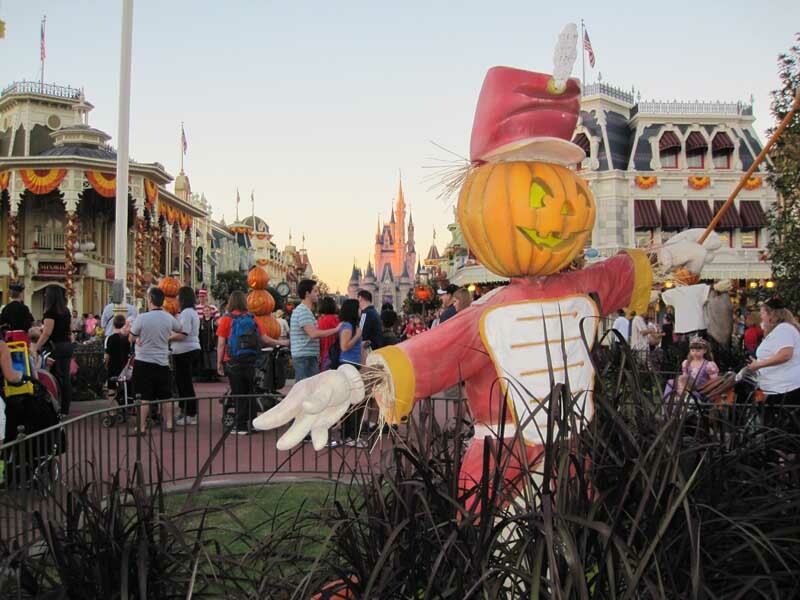 We first took the bus to the Magic Kingdom and we admired the Halloween costumes, both young and old were wearing, while waiting for it to arrive. 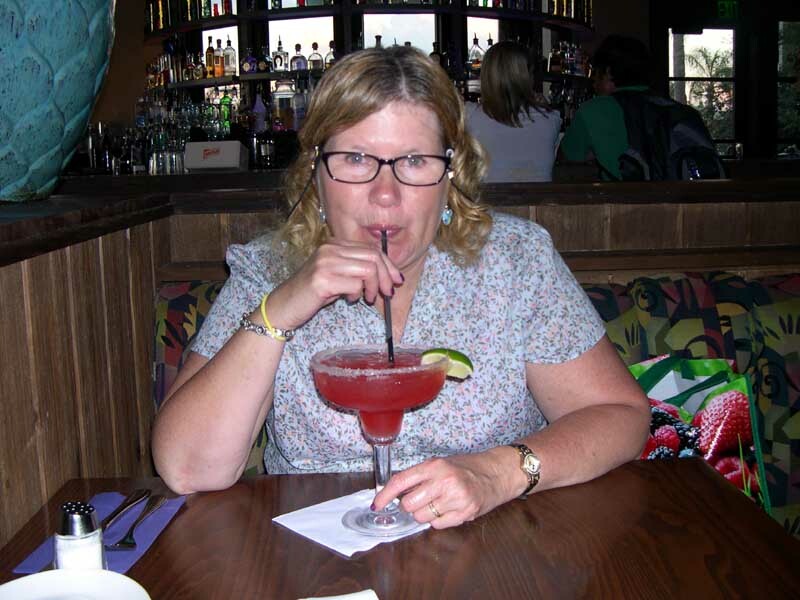 We then monorailed it to the Polynesian Resort. After a short wait we were seated. We skipped appetizers to save time and we enjoyed the Teriyaki Style New York Strip - sirloin strip grilled with pineapple teriyaki glaze served with sticky rice and stir-fried broccolini and the Coconut Almond Chicken - breaded and baked chicken breast served with a salad of Asian greens fresh fruit and almonds. For dessert we shared the Kilauea Torte - An explosion of warm liquid Chocolate inside Chocolate Cookie Volcano and Kelli got the French pressed 100% Kona Coffee. 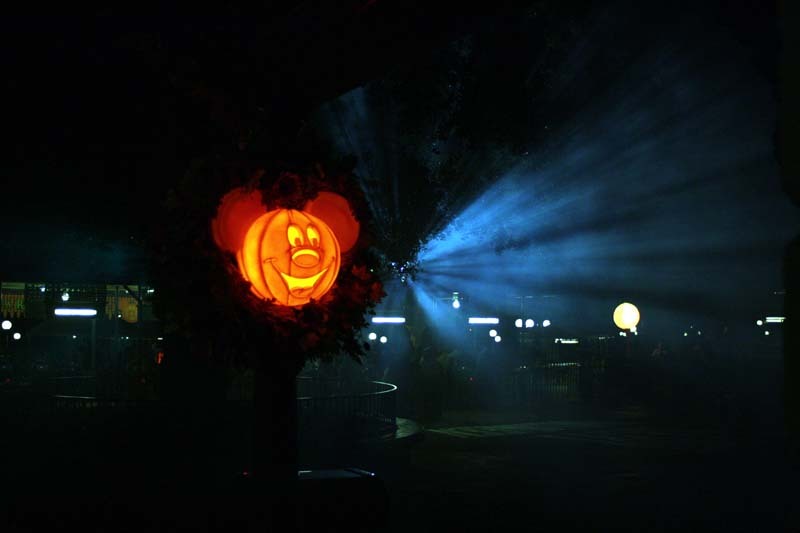 We headed in for Mickey’s Not So Scary Halloween Party at 6:30 PM. 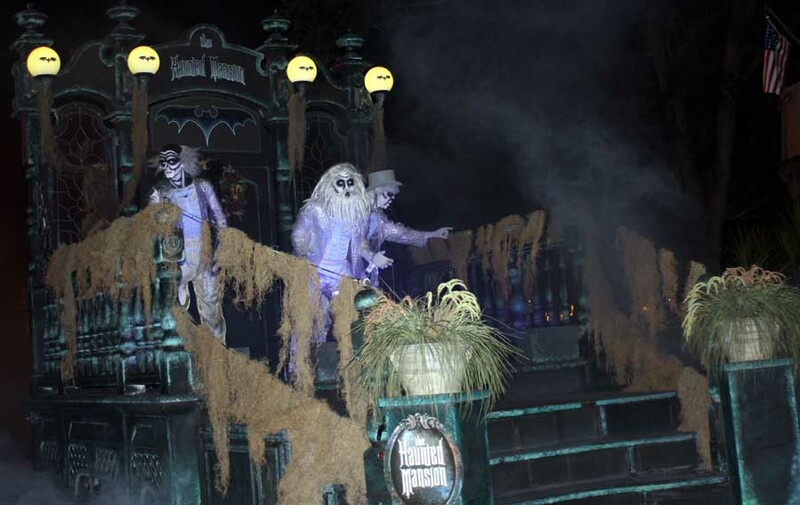 First on the agenda was to pick up the Special Sorcerers of the Magic Kingdom card (it featured Chip & Dale); then we headed to the Haunted Mansion. We waited under the outside part of the queue under the canopy till the extra ghost came out. She sat down on a bench in the grass and was in good form. We let people pass us as we listened to her comment and talk to people coming by. 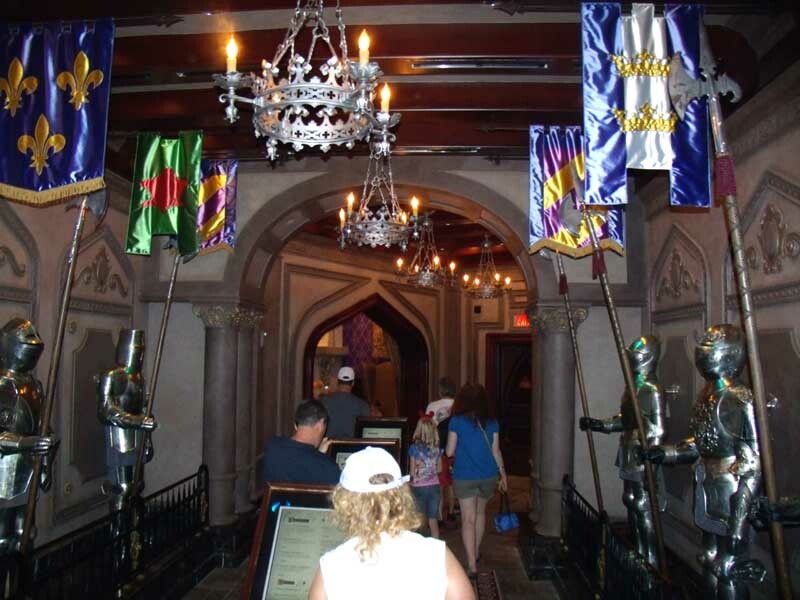 We took the longer queue into the interactive area and I showed Kelli the Finish the Poem station where the ghost recognizes your voice if you shout out the correct ending to the poem. In the stretch room I told Kelli to look up during the dark sequence – she had never seen the hanging corpse effect. After a quick rest room break we found a prime spot for the parade; outside the shooting arcade. 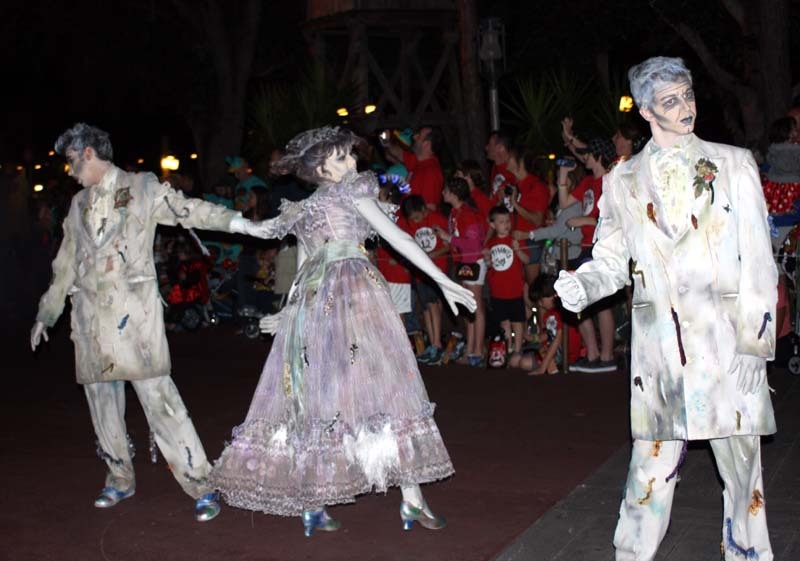 While waiting; the Cadaver Dans (the Halloween version of the Dapper Dans barbershop quartet) sang to the crowd nearby. 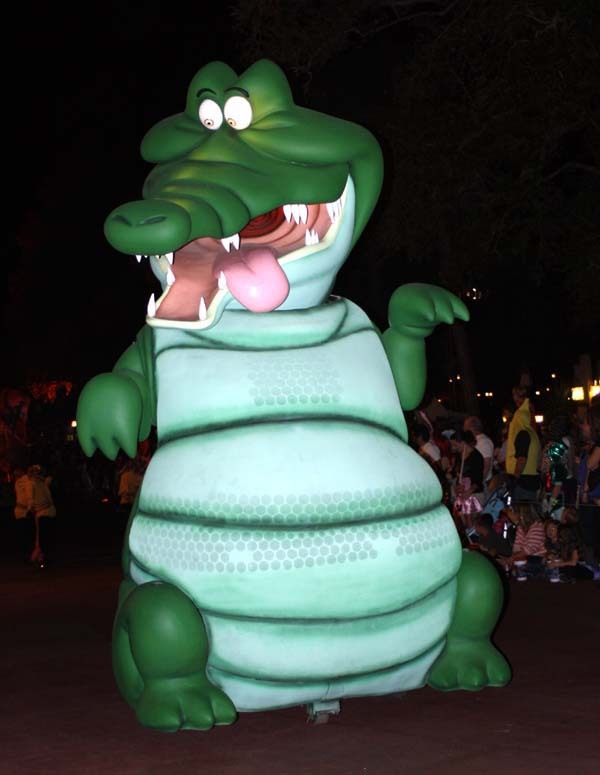 The parade was fantastic as it was in 2008, the last time we saw it. Everybody cheered the headless horseman leading the parade. We made our way towards Main Street but the chairs on the Crystal Palace veranda called our names. 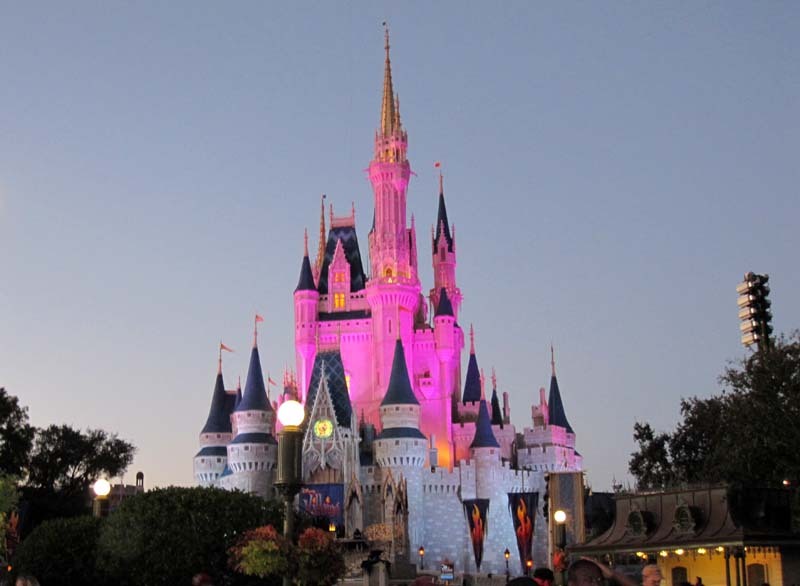 We sat and people watch while the castle changed colors. 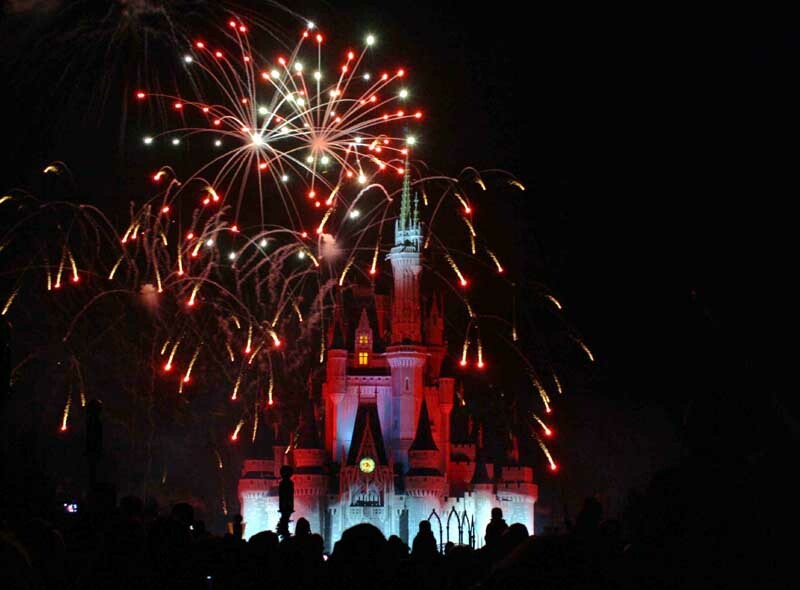 For the Happy HalloWishes fireworks; we stood at the top of Main Street. 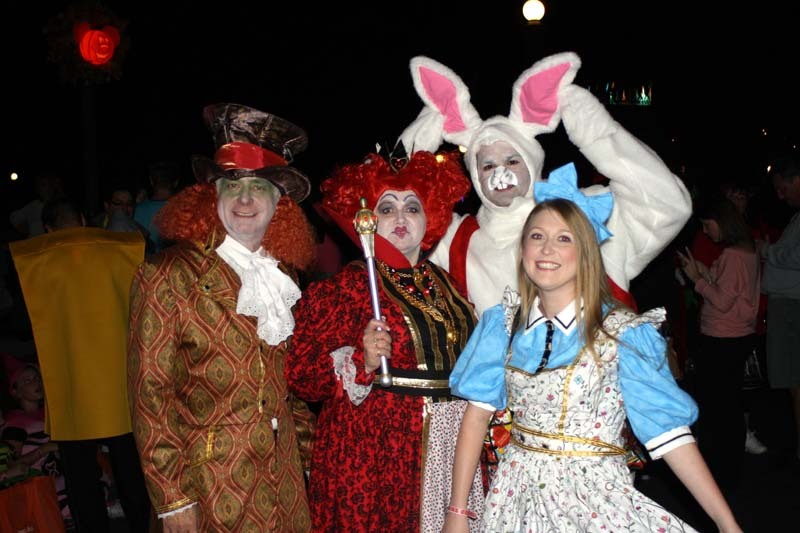 Some of the costumes in the crowd this year were terrific; we both liked the foursome dressed as Alice in Wonderland Characters. After the fireworks we let the crowd thin out and checked out Mickey’s Star Traders in Tomorrowland for any special merchandise. Then we made our way to the buses. This worked out great as only 12 people were on our bus. Another great day. We looked at the past two days as a bonus, since our first rescheduled flight would have had us arriving tonight. It was still a strange mix of emotions. We were happy to have gotten away from all the bad news, the stress on us was diminishing greatly, but did feel a little guilty being down here with all the hardships people had to deal with the aftermath of Sandy back home. We ate at the Pop Century food court, French toast and the bounty platter, checked out, and headed to Melbourne to visit friends. 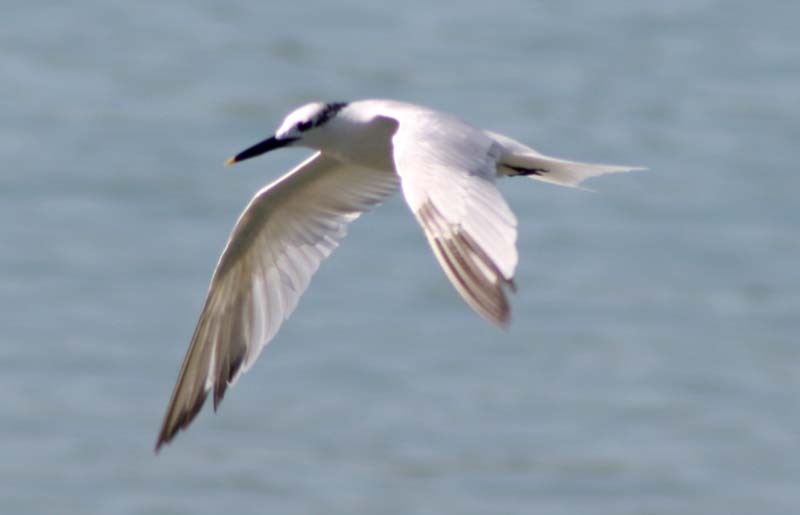 I won’t go into details here but we did visit two nice areas for birding and wildlife viewing; the Helen & Allan Cruickshank Sanctuary in Rockledge for Scrub Jays (which were not seen, maybe next time) and Sebastian Inlet on Sunday. 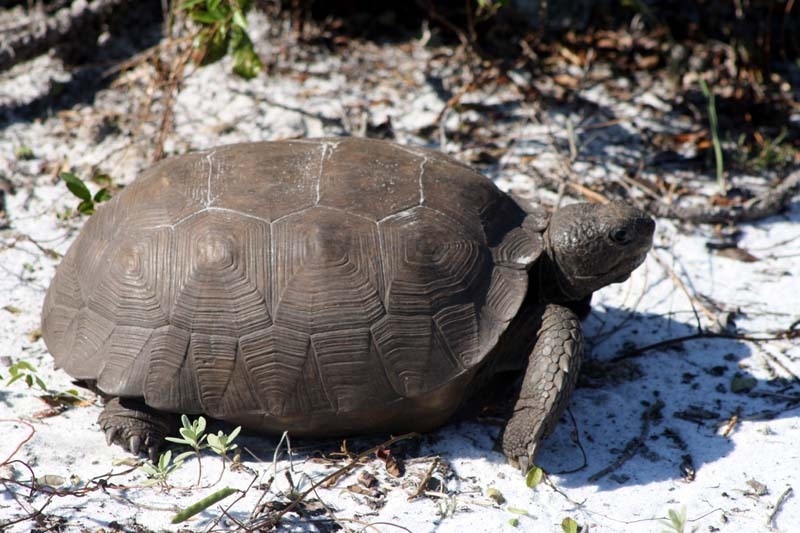 Highlights were Gopher Tortoises at both locations, dolphins, Brown Pelicans, Sandwich Terns, a species Kelli has never seen till now, and some great beach combing for shells. Another highlight in its own was the small Sebastian Fishing Museum at the Inlet. 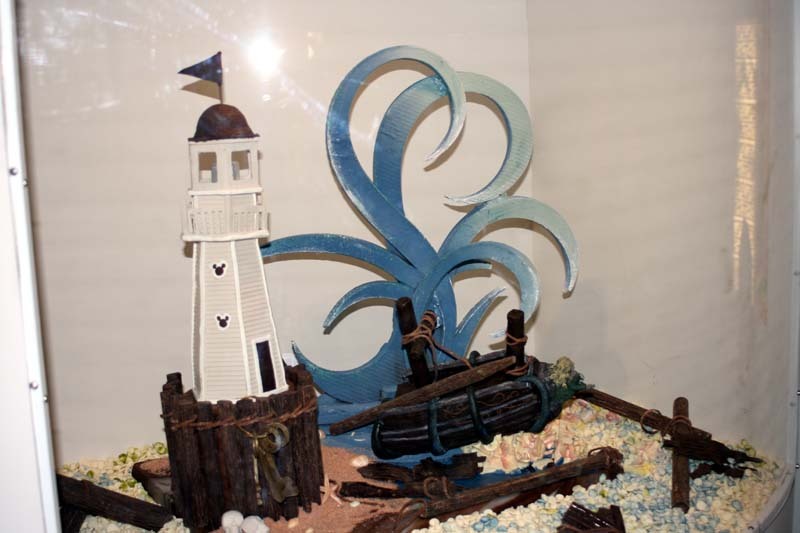 It tells the history of the area's fishing industry. 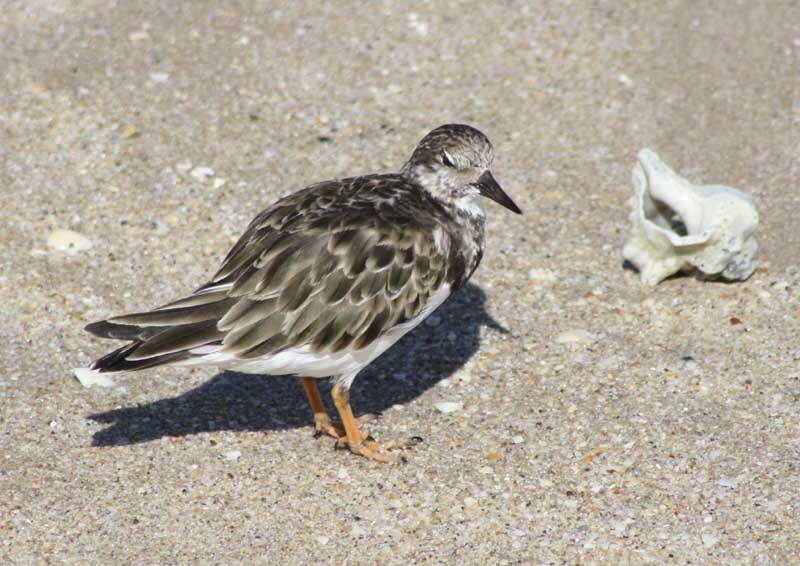 It also included a lot of other information such as what seashells are found there and their names; how the area has the most species of fish in the US because it’s where the ranges of northern and sub-tropical species meet. I also learned about Slipper Lobsters and more. We also had some nice lunches and dinners; most notable were The Shack Seafood Restaurant in Palm Bay, the New England Eatery & Pub in Melbourne Beach and TooJay's Original Gourmet Deli in Melbourne. We drove back Sunday evening, shopped at Publix for food supplies and arrived at Saratoga Springs Resort at 8:45 PM. Our request for a high floor in the Congress Park section was granted but we did not get a view of Downtown Disney, just some trees that obscured the parking lot. 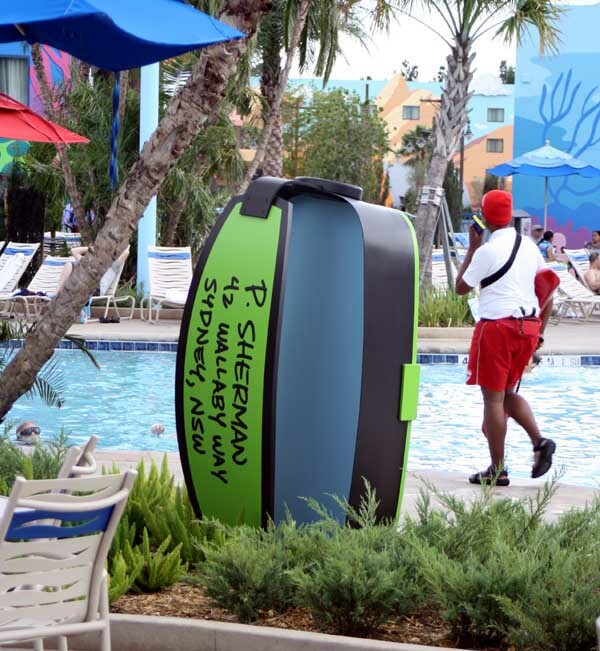 One little thing that struck me were the differences in the shampoo bottles between Pop Century and the DVC resorts. 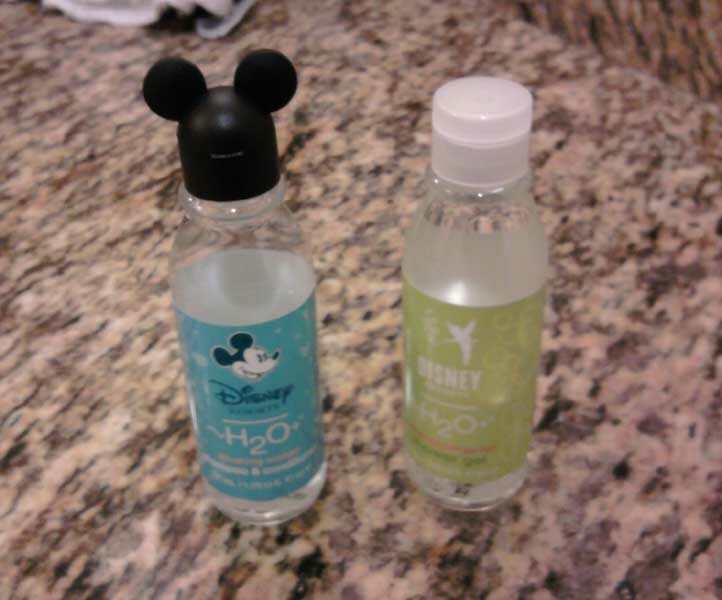 Both are the H2O brand but the bottles at Pop have whimsical Mickey Ear caps on them. We took a walk to The Artist's Palette just before it closed to look around. Back at the room we now heard that a Nor’easter might hit the northeast; bring rain, snow and more wind. Monday morning had me up early to make the coffee. But the coffee maker leaked coffee all over the place. I discovered it was missing a small but critical piece. I called mousekeeping for a replacement; within 20 minutes Marie knocked on our door with a brand new coffee maker. Kudos to Marie for the quick service. We enjoyed breakfast on the balcony and I let Kelli relax a bit while I did some laundry down near the pool. During the wash cycle I took a walk to Downtown Disney and turned around at the World of Disney store. The walk from the pool to the beginning of the shopping area was only 8 minutes, and an additional 4 to the large Disney Store. This was at a leisurely New Yorker’s pace so your time might be more. During this time Kelli made arrangement for a Mani and a Pedicure at 4 PM at the Saratoga Springs Spa. 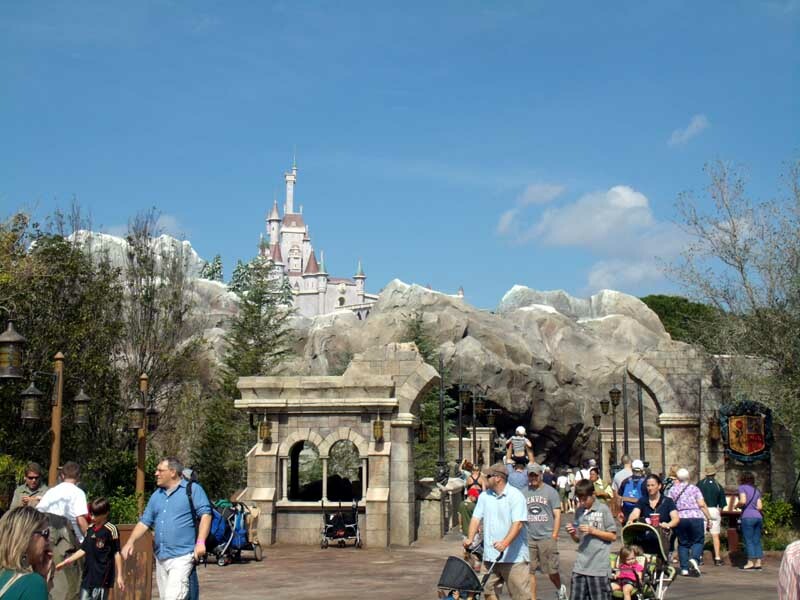 So we decided to head over to the Magic Kingdom a little earlier then planned to check out the new Fantasyland. 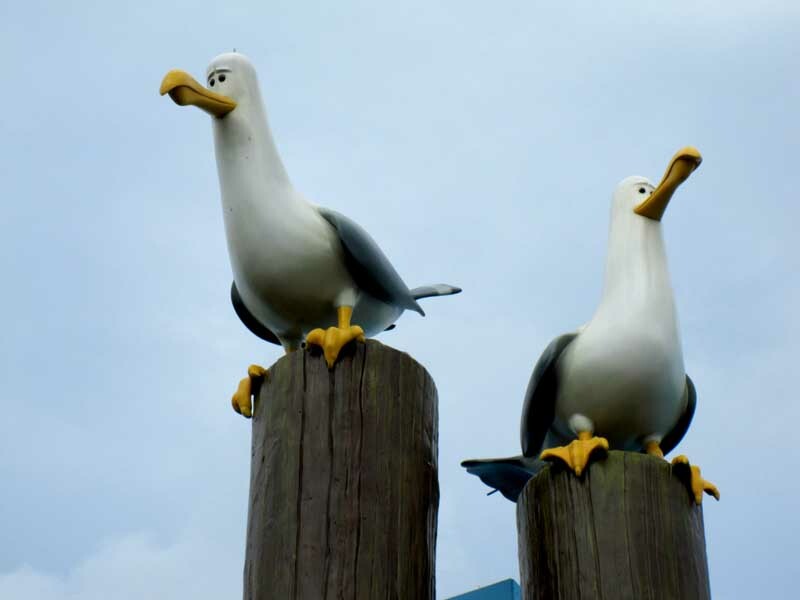 DVC members could get a sneak preview of the new attractions today, if you had signed up in advance. 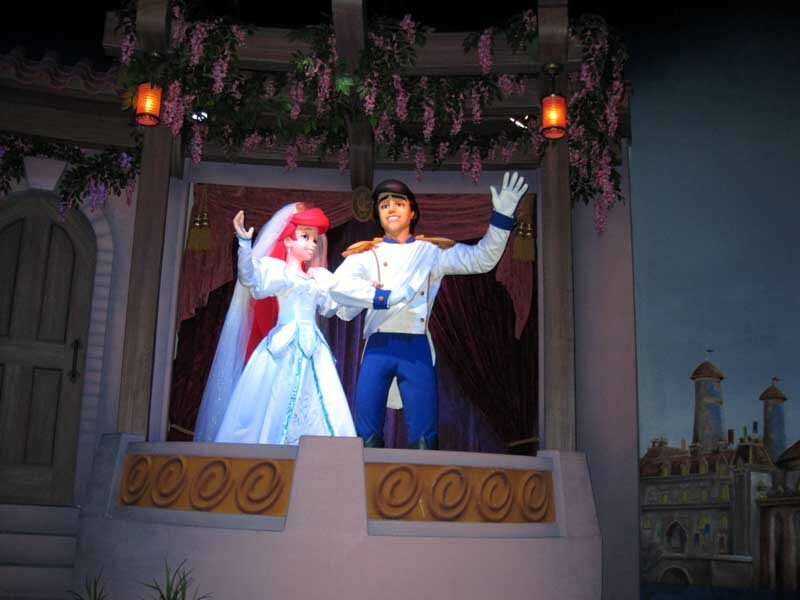 We had chosen the Enchanted Tales with Belle Itinerary. 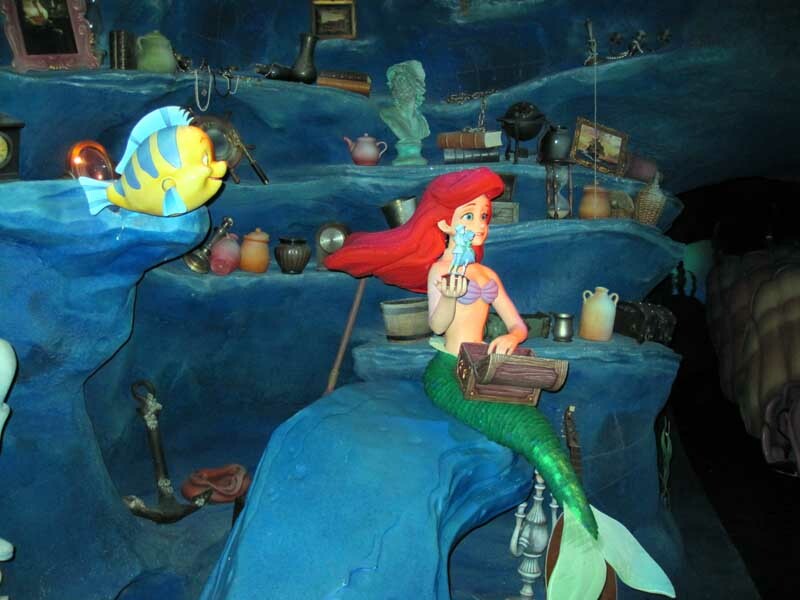 We would be able to enjoy the Under the Sea ~ Journey of The Little Mermaid attraction, take a self-guided tour of the Be Our Guest Restaurant and experience the Enchanted Tales with Belle. We took the bus to the Magic Kingdom and found that the check-in was on a small dock on the way to the entrance. They gave us wrist bands to allow us into the new area. 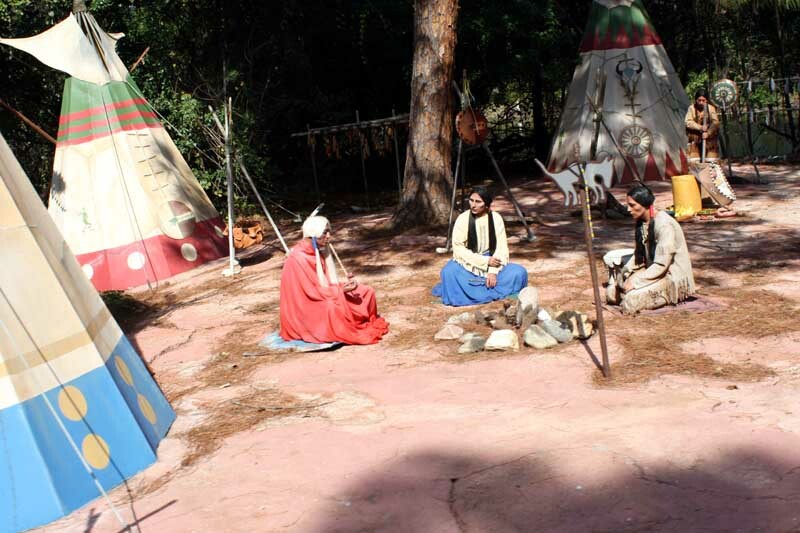 We took the Walt Disney World Railroad over to the Fantasyland station and enjoyed some of the scenes you can only see by this train, including the Indian village and fake alligators. We walked over to the new area and entered. Just let me tell you now that the area, attractions, restaurants were Outstanding! 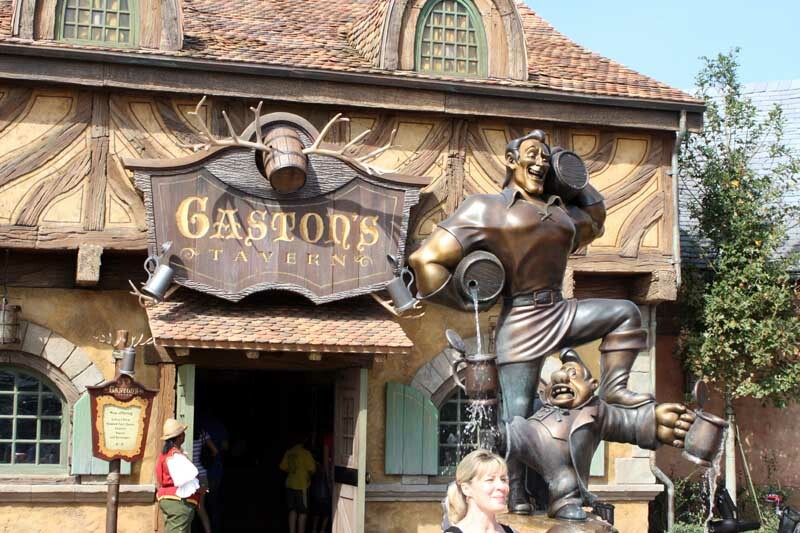 We were hungry so we decided to have lunch at Gaston’s Tavern. We tried the Roasted Pork Shank (aka the "Shank du Jour"), Hummus with pita chip (prepackaged but good) and a LeFou's Brew which looked like a beer. It’s frozen apple juice with a hint of toasted marshmallow and topped with all-natural passion fruit-mango foam. We devoured the pork and Kelli really liked the brew. 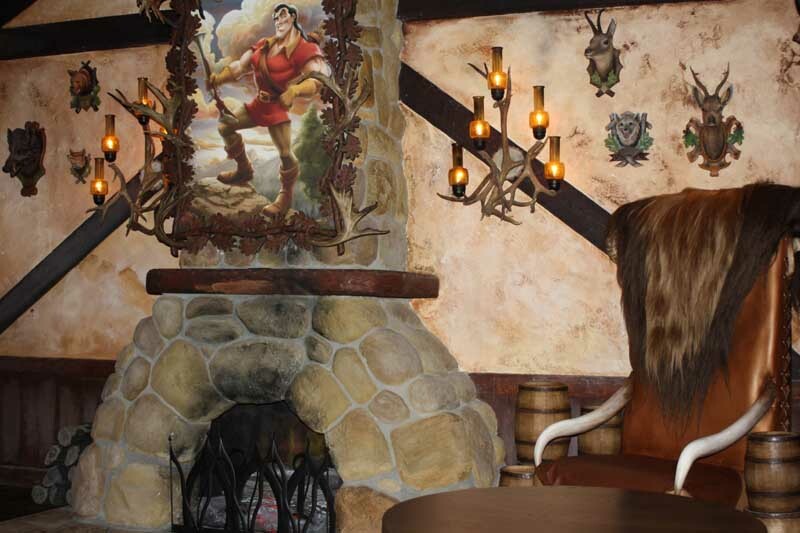 The decorations inside the tavern included Gaston’s giant chair, antler chandeliers and a dart game with Gaston winning big. 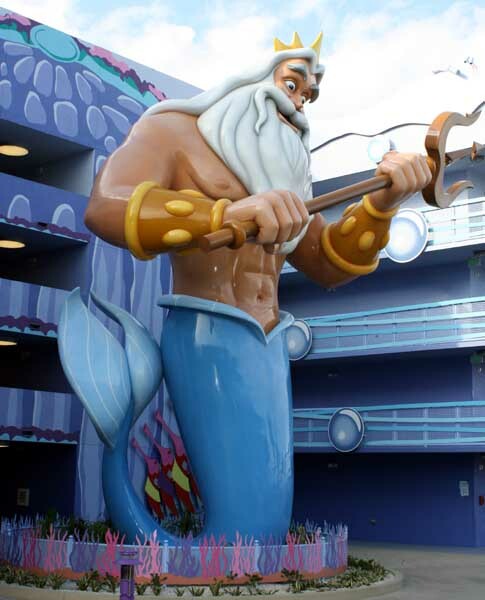 It was then on to the Under the Sea ~ Journey of The Little Mermaid. The queue was well done with an interactive queue featuring an animated shrimp at different points. It was hard to spend a lot of time here as you were holding up the line and nobody wanted to pass you so they could see the little guy as well. 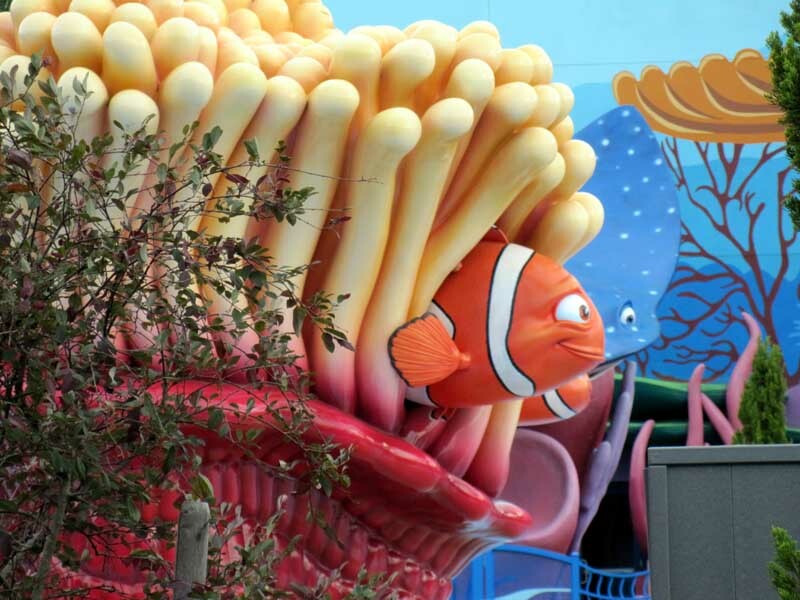 We soon climbed in our clammobile and the animatronics were great. 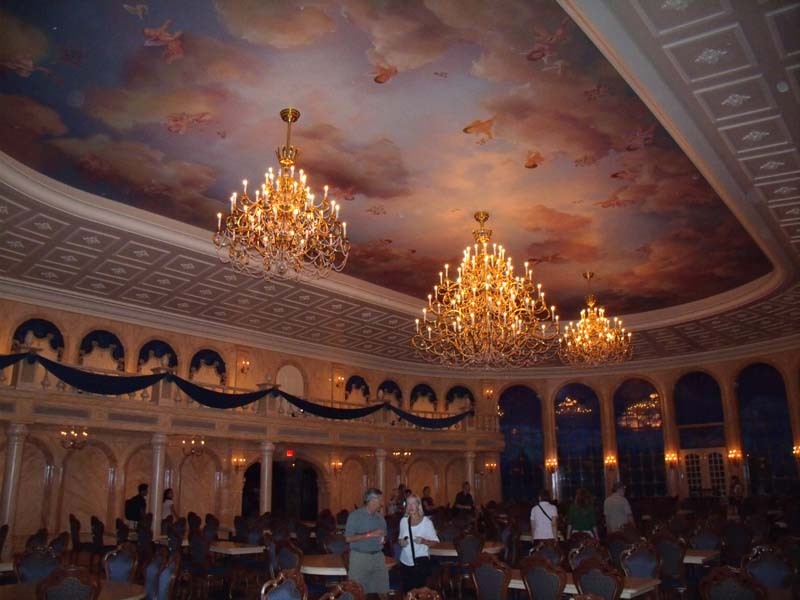 Next was to check out the Be Our Guest Restaurant. I wasn’t expecting much. Why would I want to see the restaurant when it isn’t even open? But Wow, the detail and scope was breathtaking, from the main ballroom to the wing with the rose and the changing ripped portrait. If you are planning to eat here when it opens – you will be impressed. 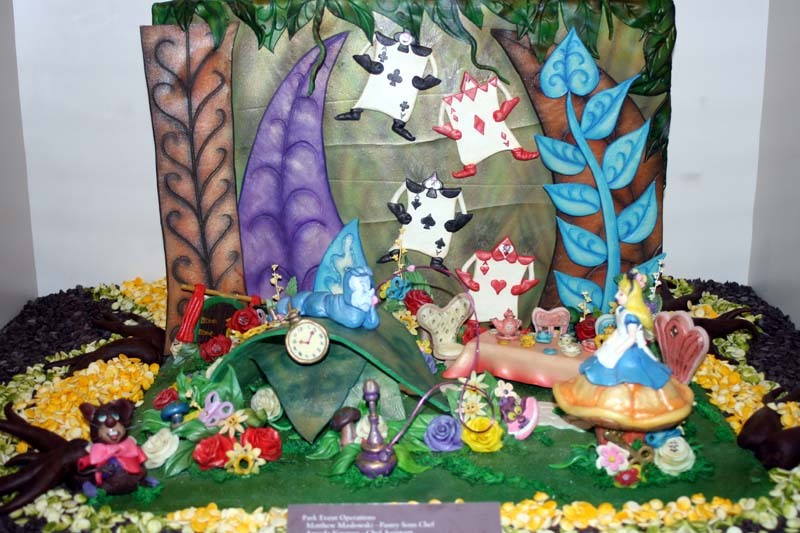 We made our way to Enchanted Tales with Belle, there was a moderate wait; it took about 25 guests at a time. I think this is where Disney was at its best. 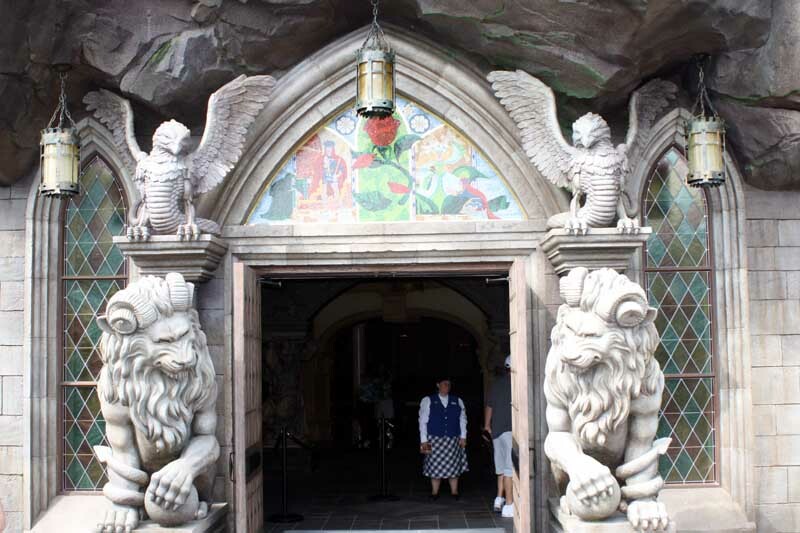 The changing magical mirror entrance was beyond belief. 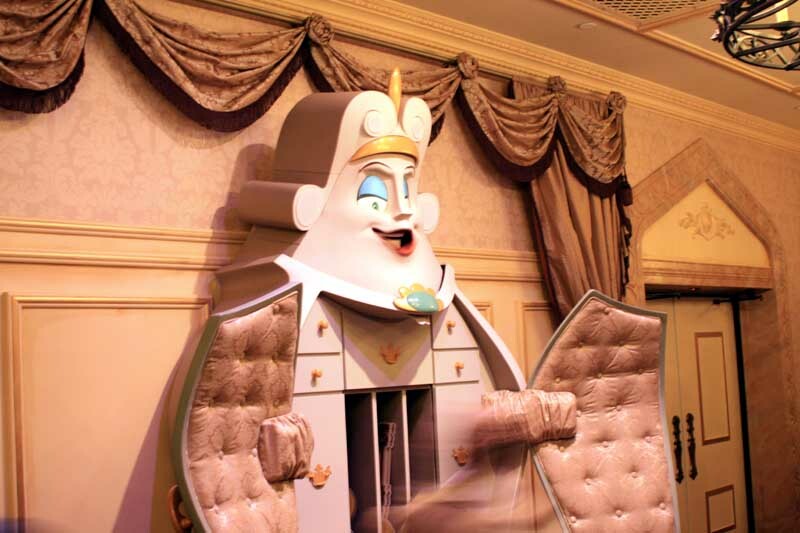 Interacting with the characters The Wardrobe and Lumière was amazing and the personal touches with Belle even brought a tear to our eyes. We were not chosen to participate, but watching the children’s faces on meeting Belle was priceless. The little girls were just beaming while the little boys look terrified! I guess they didn’t like being in the spotlight. We had passed on the Warm Cinnamon Roll at Gaston’s Tavern at lunch so we went back to try it. It was ok, but not nearly as decadent as other gooier, cinnamonier rolls (i.e. Cinnabon). 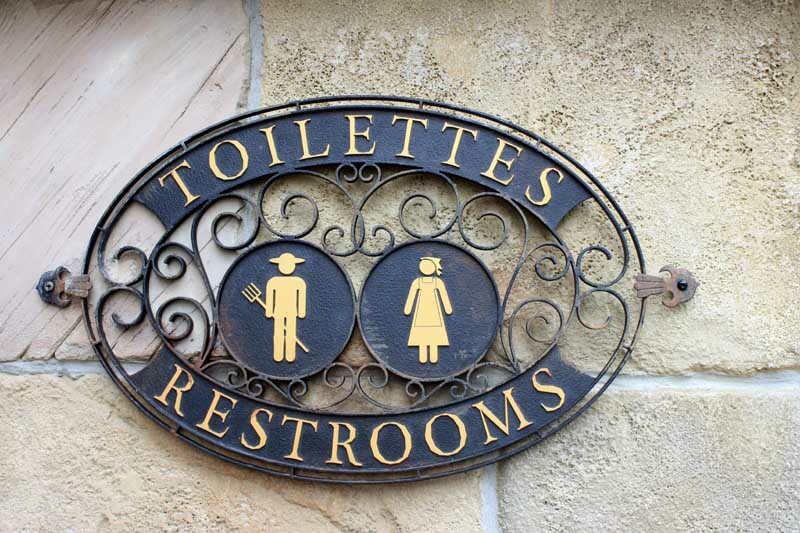 We needed a restroom break and even here the signs had a unique French flare. After the obligatory shopping in the new area we made our way out, but not before seeing Gaston himself posing with other guests in front of his tavern. 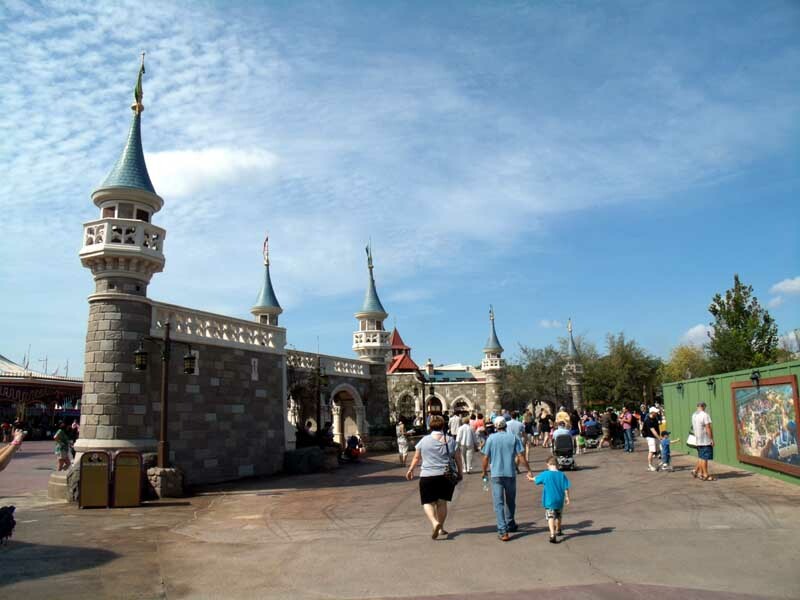 We first tried to take the train back to the front of the park, but the wait was huge at the Fantasyland station, so we walked. Fortunately we were able to walk right on to a waiting bus. Back at the resort I dropped Kelli off at the spa and I relaxed in the room before heading back in 90 minutes to pick her up. She had a good time but she did say she felt more comfortable going to Periwig's Salon in the Beach Club since she was simply going for a manicure/pedicure. Dinner tonight was at the resort’s restaurant, The Turf Club Bar and Grill. Reviews generally refer to it as a hidden gem among DVCers. 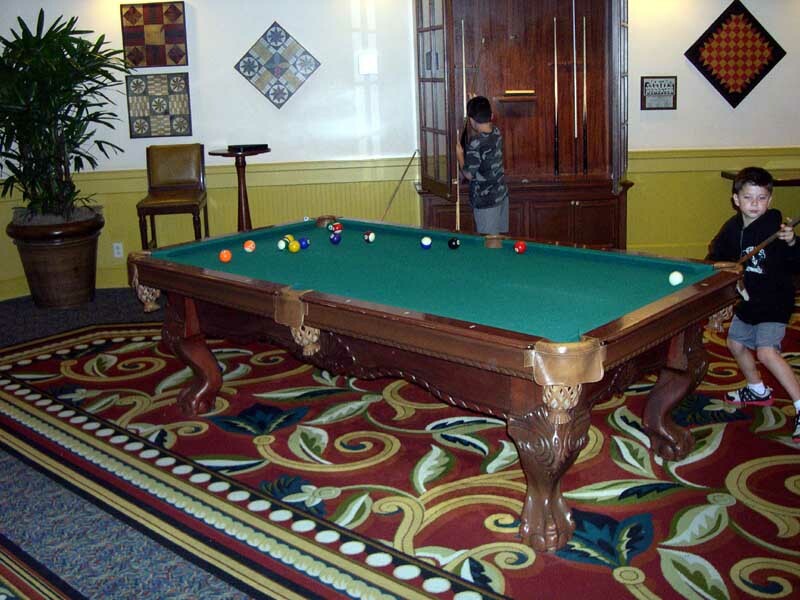 I noticed the pool table in restaurant lounge. This is the first one I’ve seen in Disney, good to know if you’re looking for one to play. I tried a cocktail called Three Minutes to Post Time – Bacardi Black Razz Rum, Blue Curacao, Beefeater Gin, Skyy Vodka, Sprite, and a splash of Orange Juice. We shared the Crab Cake with Sweet Chili and Garlic Aïoli. 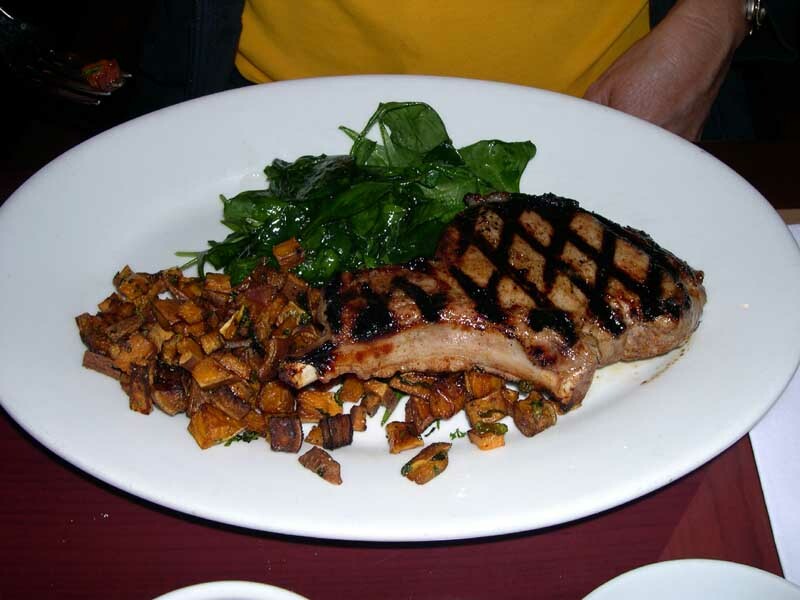 I had the Turf Club Pasta - with Shrimp, Lemon, Garlic, Cream and Parsley and Kelli opted for the Root Beer Brined Pork Chop - with Sweet Potato Hash and Sautéed Greens. 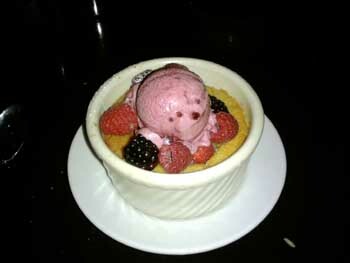 And we finished off a good dinner with their Berrymisu dessert. 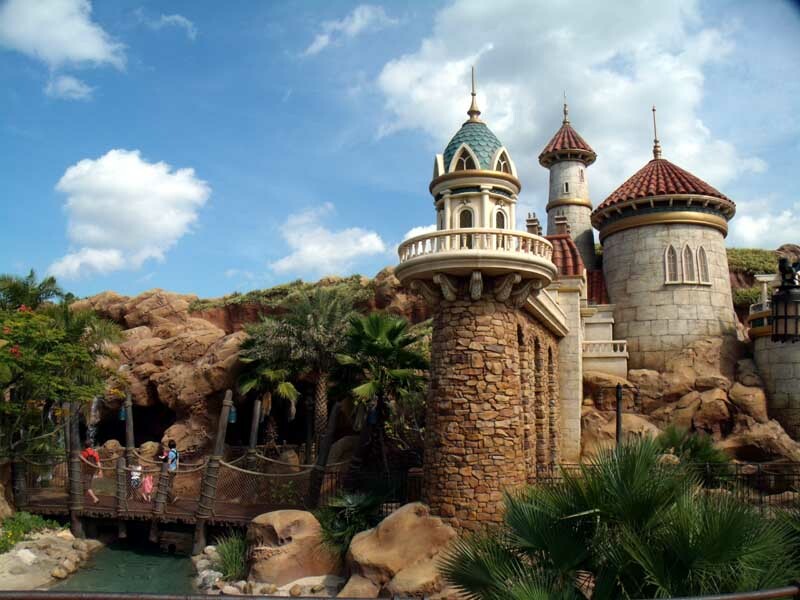 We were blown away with the new Fantasyland expansion. This will be crowded for months once it’s fully opened. It was great to see it at a leisurely pace. We slept in a bit, we are not storming the parks this trip. 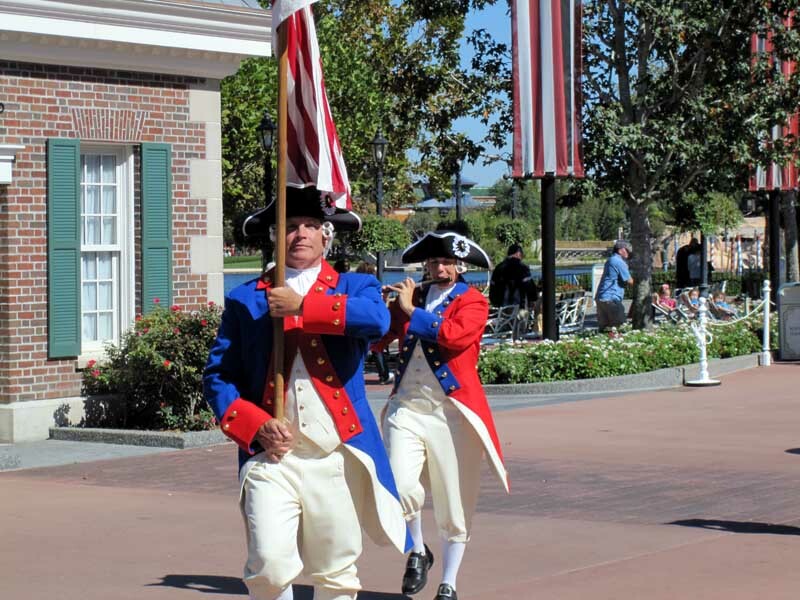 We did leave for Epcot in time to make it to the World Showcase and the festival when that section opened. 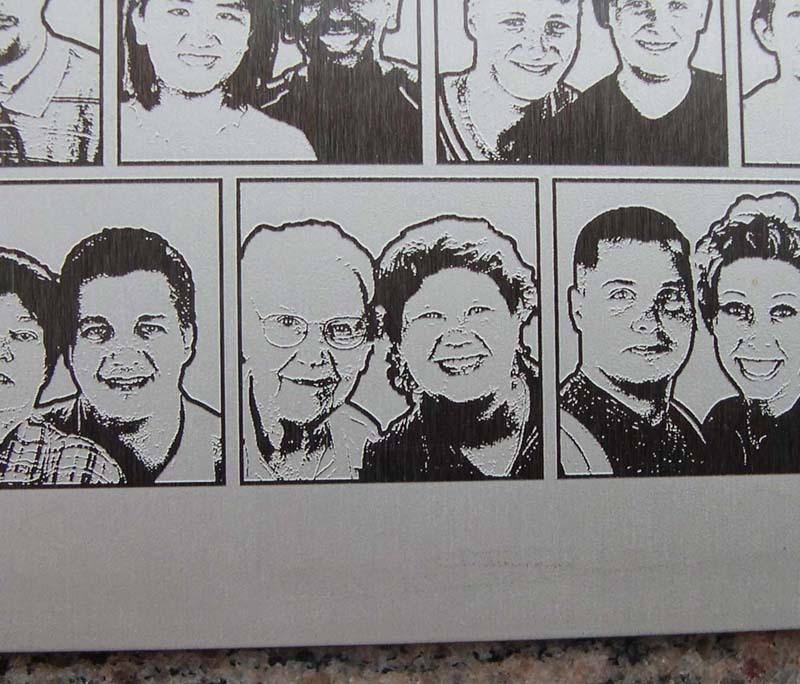 The first thing I wanted to do at Epcot was to find Kelli and her mom’s picture on the Leave a Legacy pylons. A cast member easily found the location on a computer inside the camera center. He jotted down the locations and once we got our bearings right, it was easy to find. We went counterclockwise this time to hit some of the booths that we were too full the last time. We were both ready to try our first snails as well. The sausage from Canada had a great spicy hot kick. The escargots were quite good. I even tried one without the brioche, not chewy at all, the texture was fine, a bit earthy in taste but I will try them again. The Chocolate Créme Brûlée was outrageously good. We will be back for more. As for the dessert trio, all were good, but our favorite was the yogurt panna cotta. 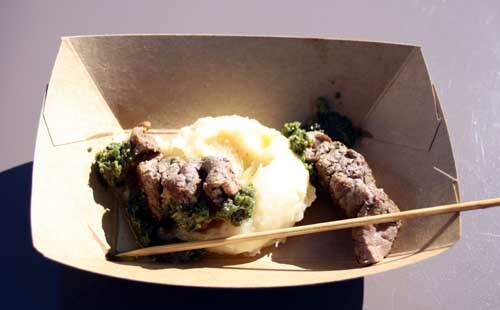 Our culinary demo for the day started at 1PM, so we headed to the festival center and got in line. We did not know we had to first check in and get our tickets; but a couple of friendly ladies from Florida told us and even offered to hold our place in line. It did not matter since when we returned they already let people in. We sat next to our two new friends from Florida and had a nice time with them. 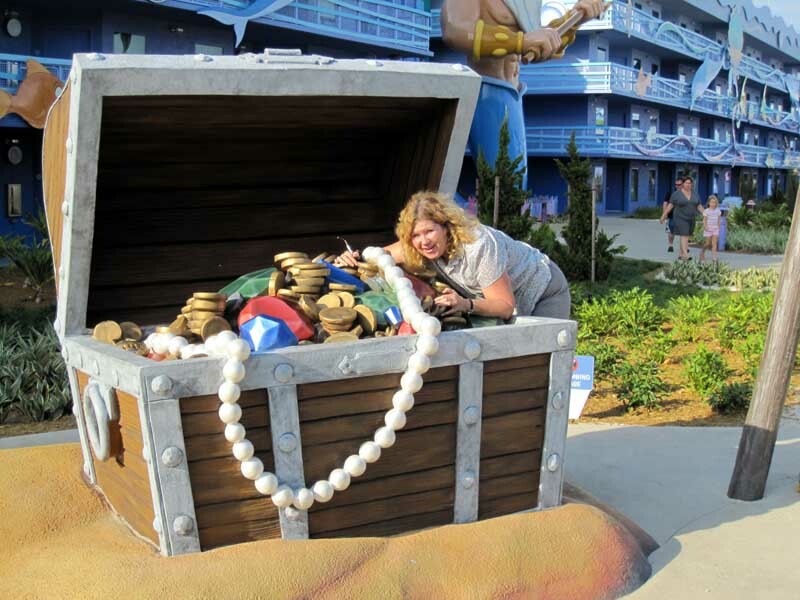 One of them mentioned that she volunteers for the Disney half and full marathons. My niece will be running the Princess half marathon in February and I wanted to get some tips from her but the demo started and I never got to chat with her. Michelle did mention that we had to try the 17th Anniversary Festival Beer– Samuel Adams Chocolate Bock at the Hops and Barley booth. Kelli had the compliment of the day. One of the ladies thought that Kelli was my niece! The demo was fun, delicious, and informative. It was presented by Wendy Bazilian and Jon Ashton and was sponsored by Driscoll's. You might buy their berries in your local food market. 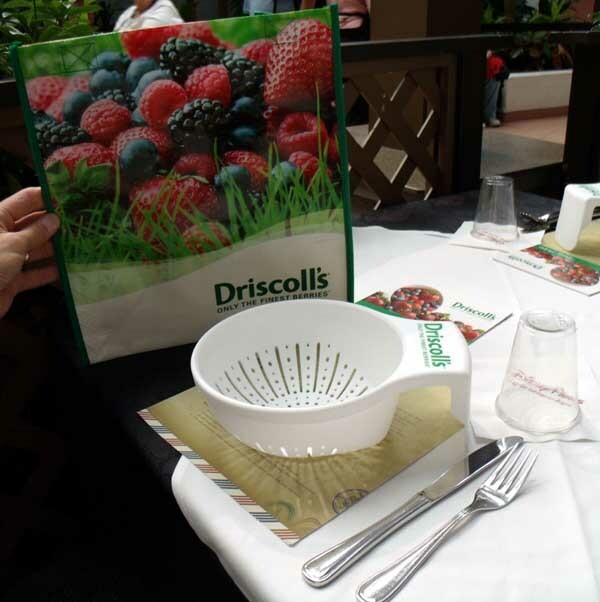 We each got a fruit strainer and reusable Driscoll's shopping bag. We learned that the little parts of a blackberry have a name, drooplets; and the top of a strawberry is called a calyx. They also informed us that the purple colorant in blueberries called anthocyanin has health benefits. What’s the difference between bruschetta and crustini? Bruschetta is grilled while crustini is baked in an oven. Most important of all it was pointed out that many of us do not have our refrigerators at the correct temperature. It should be 39 to 40 degrees F ( 4 degrees C for the rest of the world) to prevent food from spoiling too soon. The sample plate consisted of Brie & Blackberry Wonton, Strawberry Bruschetta, Thai Turkey Meatball. The wine was Acacia Vineyards Pinot Noir, Carneros. 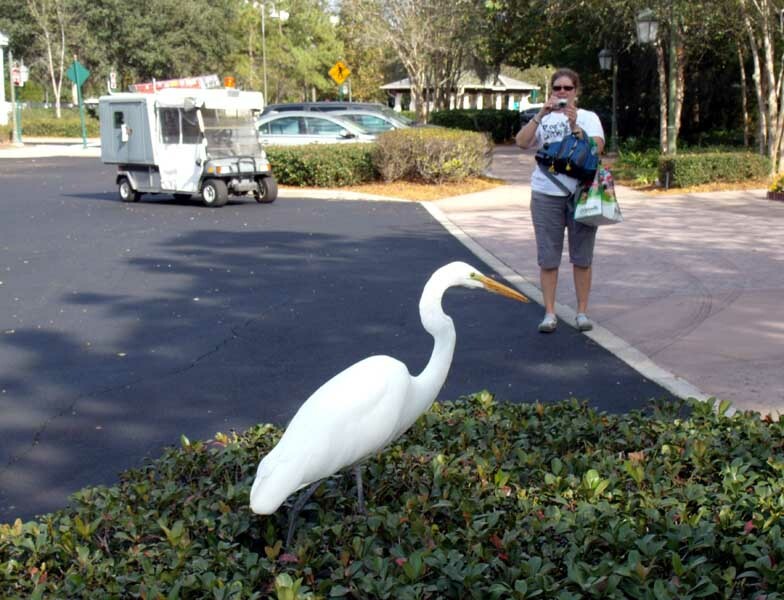 We headed back to the resort where we found a Great Egret in front of our building. He was very approachable and we watched him as he hunted the paths and bushes for lizards (actually called anoles) to eat. We spent more time in relaxing in the pool before getting ready for dinner. 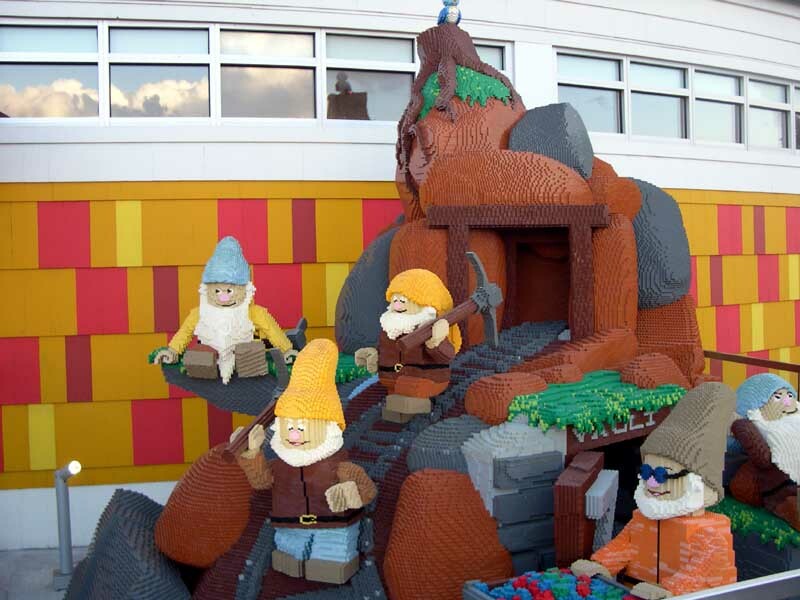 We walked to Downtown Disney and noticed all new Lego sculptures around their store. Dinner tonight was at Paradiso 37, Taste of the Americas. We found out that the 37 stands for the number counties represented in North and South America. We sat in the first room, near the bar. What I did not like about this area was the LED lighting that changes. LED lighting is known to irritate people. Science stuff: Most LEDs only have three spectrums of light and even when they are all on to create white light, your brain still notices the missing spectrums in between even though you perceive it as full spectrum. It tends to strain your eyes and your brain, looking for that missing light. Next time we will sit in the other room or outside. For drinks we had the Strawberry Margarita and their Beer P37 lager. 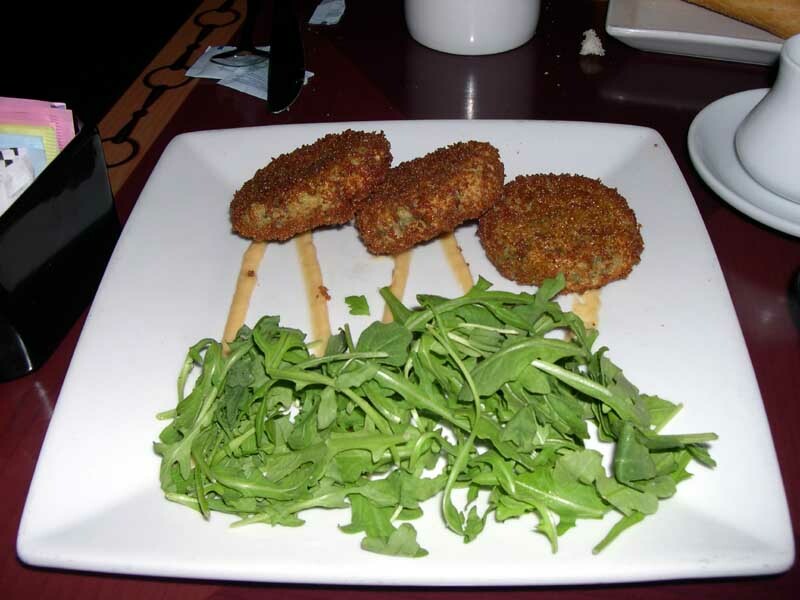 We ordered the appetizer - Mac & Cheese Bites - crisp on the outside, creamy on the inside, served with a jalapeno and cilantro dipping sauce. They tended to have the flavor of old frying oil. We’ve had much better versions at the Cheesecake Factory. The entrées were Chicken Enchiladas - with corn tortillas, mole verde sauces, cilantro rice and black beans and Beef Burritos - with flour tortilla, hot Sautéed Peppers, Squash, Red Onions, Imported Cheeses, Sweet Chipotle BBQ Sauce, Cilantro Rice and Black Beans. Very good Mexican food, the cilantro rice was delicious. 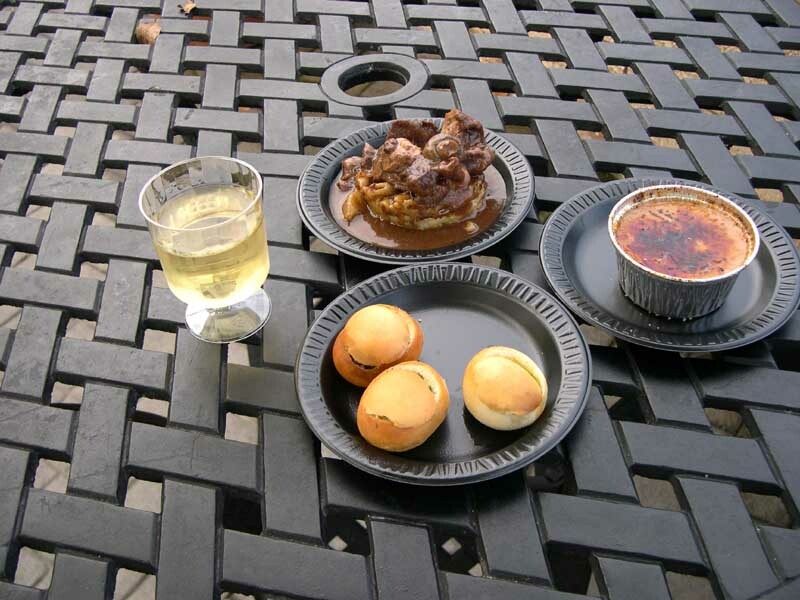 Comments: Epcot’s Food and Wine Festival is turning out to be even better than we imagined. 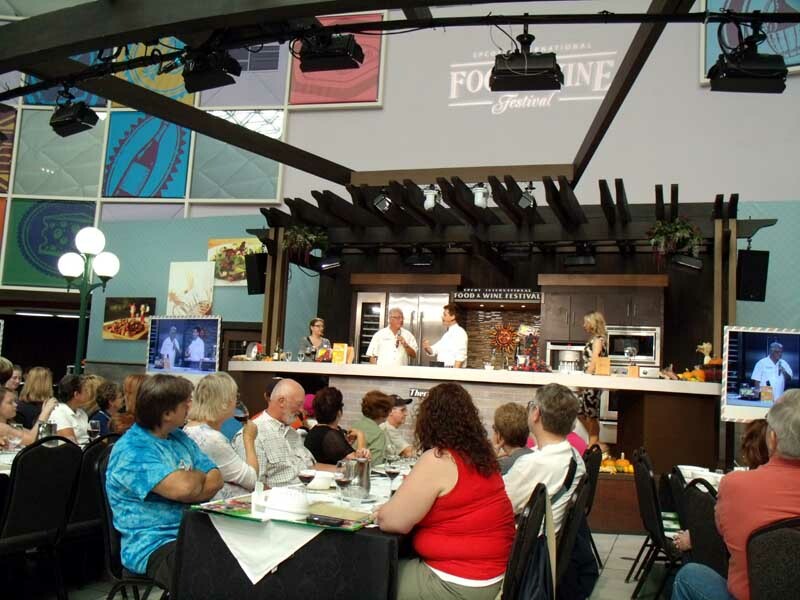 The Culinary Demos are well worth the time. I was up early. It was cold, only 49 degrees (9 C) with a brisk wind. Kelli slept while I decided to hit Hollywood Studios. I had some time so I detoured to find the path from Saratoga to the Tree House Villas and did a quick peek around. We will stay here next summer. Kelli and I will take a better look around on Saturday. I drove over to the studios but it was still early. The Christmas tree in front was already up. Waiting in line was cold. I had to hide out in the restroom for a while to keep warm. 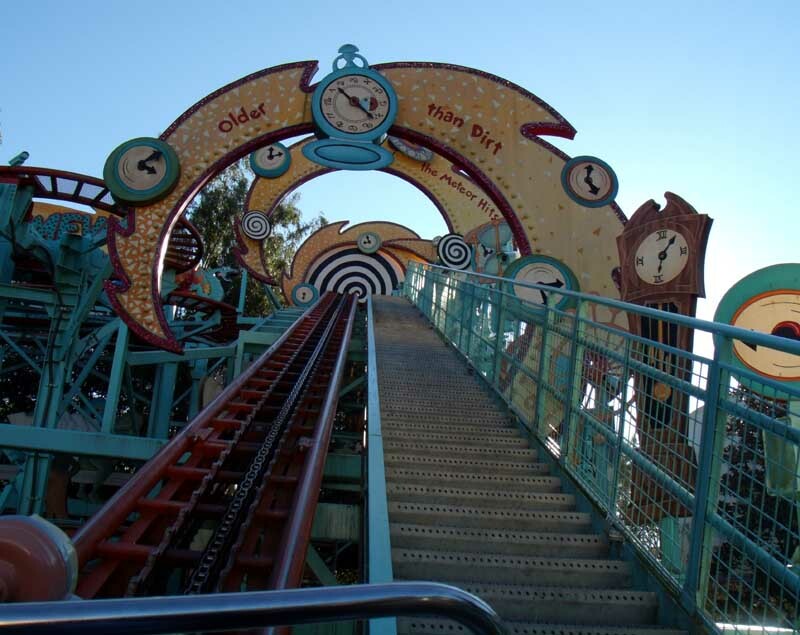 Once the park opened I quickly rode the Tower of Terror followed by two exhilarating rides on the Rock n Roller Coaster. I crossed the park and rode Star Wars and by luck had all my favorite sequences including Darth Vader, Tatooine Pod Racing, Yoda and the underwater sequence on Naboo where the giant sea creature tries to eat your starspeeder. I love when its slimy tongue grabs hold of the ship’s windshield. I headed back, ate a quick breakfast on the balcony with Kelli and we headed to Animal Kingdom. The parking lot was crowded! They had us park on the grass next to the pond! 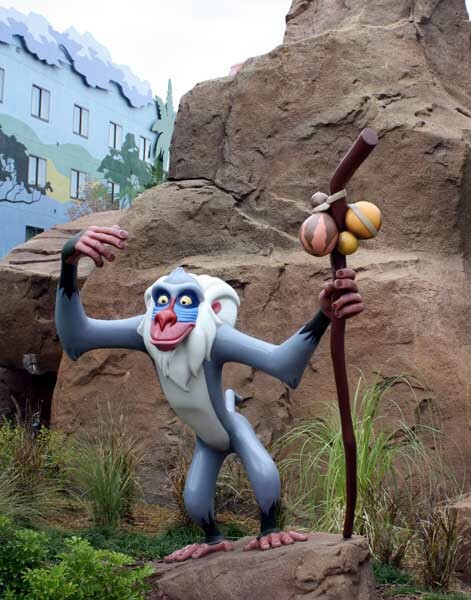 I bet most of you did not know the Animal Kingdom lot had a pond! We had to take the tram in. It was still cold and the air rushing by you as the tram moved made it frigid. The tram operator joked that they have been trying to get the air conditioner to work since the summer and finally got it working this morning. We decided to do It’s Tough To Be a Bug first, and also to warm up. 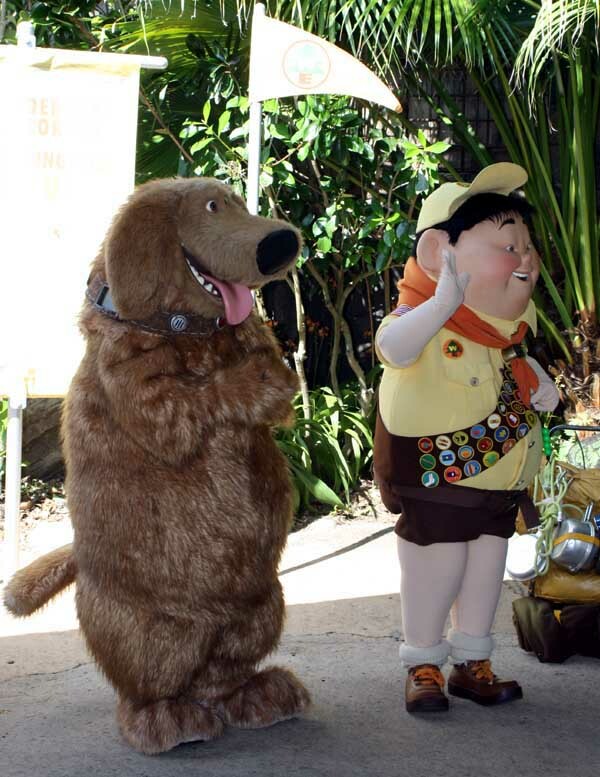 Dug and Wilderness Explorer Russell ("Ca - Ca! RAWRRR!") from "UP!”were posing for picture just outside. Next up was the Maharajah Jungle Trek. 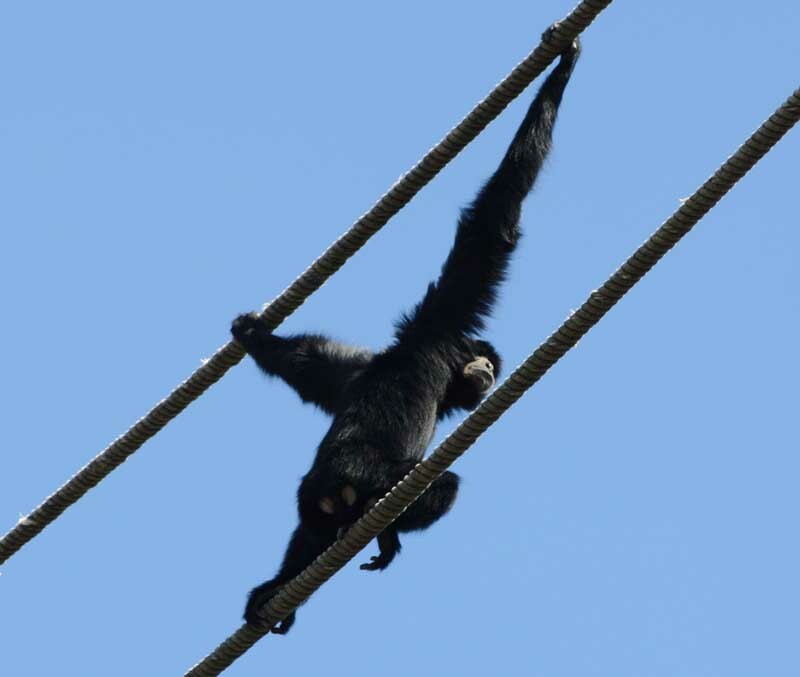 We watched an acrobatic White Cheeked Gibbon on the way. He put on quite a show swinging around the high ropes. He was quite the aerialist. 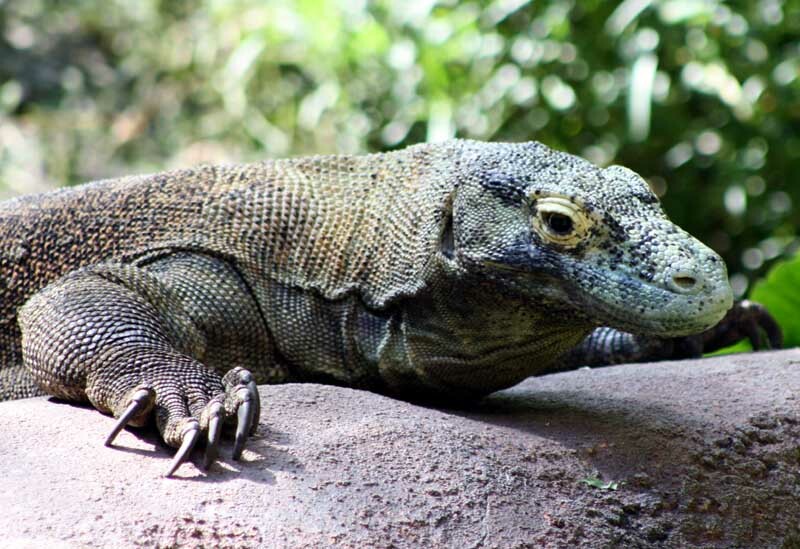 In the trek I finally got to see a huge Komodo Dragon. 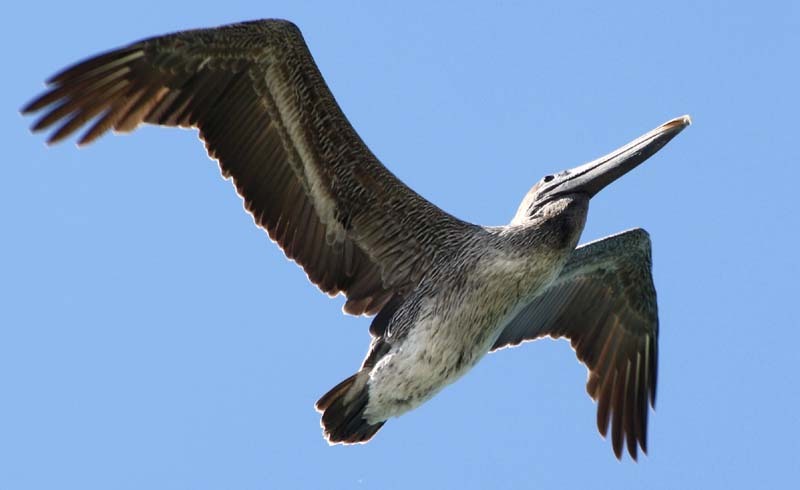 He was sunning himself on a large rock and had to be about 7 feet in length. 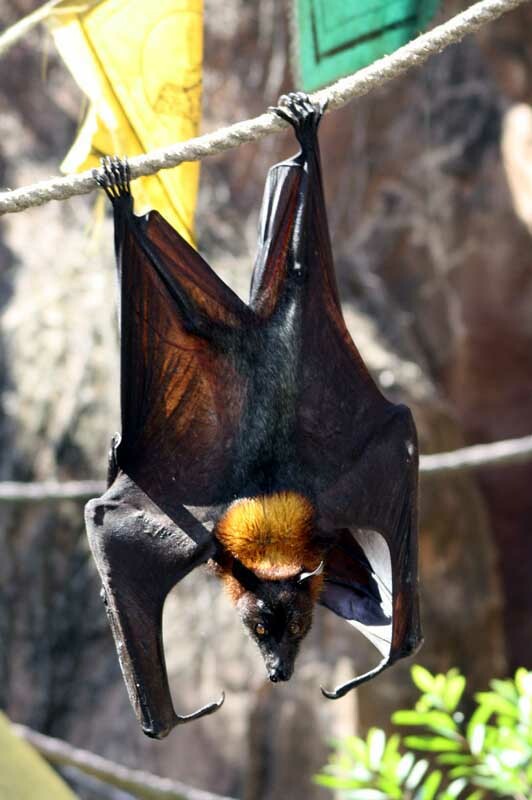 Malayan Flying Foxes (fruit bats) seem to pose for portraits. Some also were fighting for just the right spot to hang around. 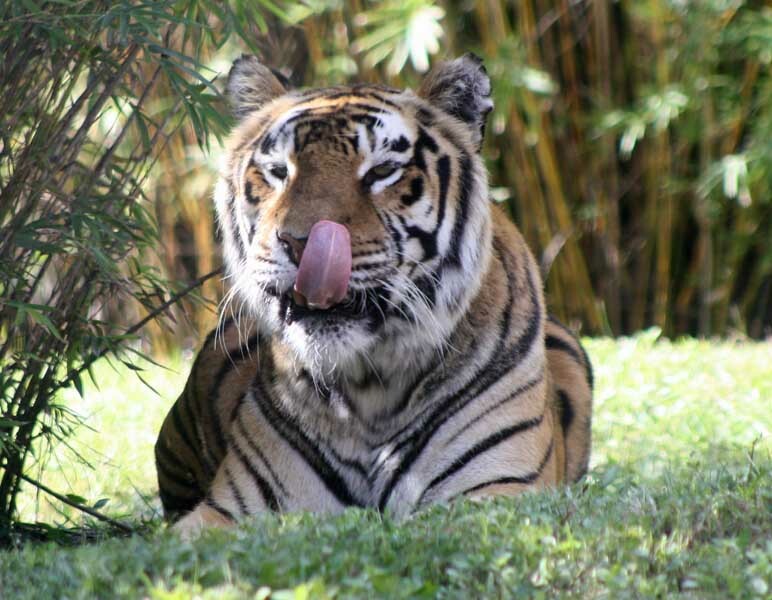 The tigers were out. 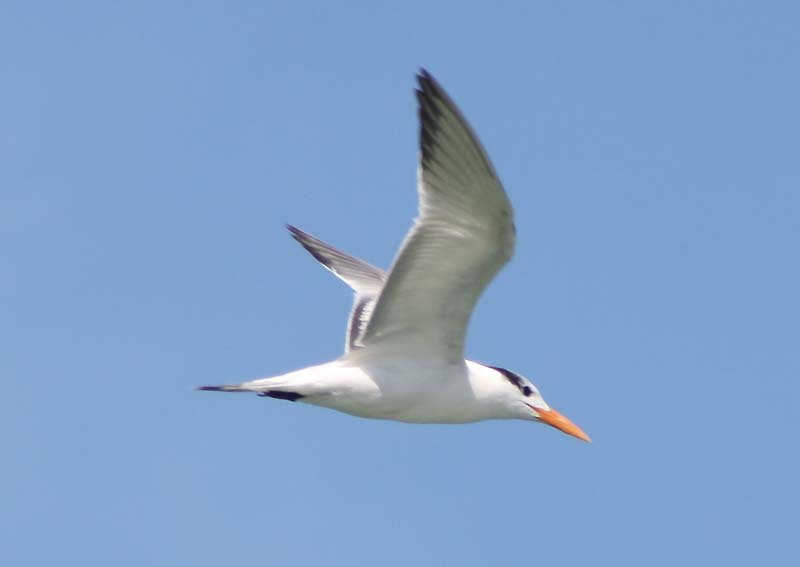 They were not too active but some were in great spots to be viewed and photographed. The aviary was full of activity and we spent quite a bit of time in here. 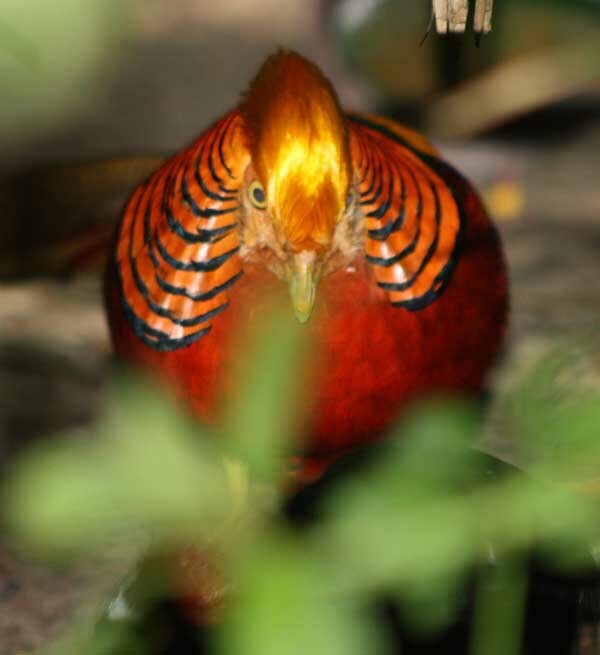 We have not visited Conservation Station and Rafiki's Planet Watch in years so we boarded the Wildlife Express Train. Kelli is not even sure she has been here before. There is still not much to see on the train but the narrative given aboard explaining the back stage areas where the animals are kept was interesting. Some of the kid’s activities along the path looked interesting and I might try some similar things at our local nature center back home. In the center I noted that on the next rainy day, or unbearably hot day, I might come back here to watch all the movie shorts they have. But not today. Many people got a kick out of the poop exhibit. 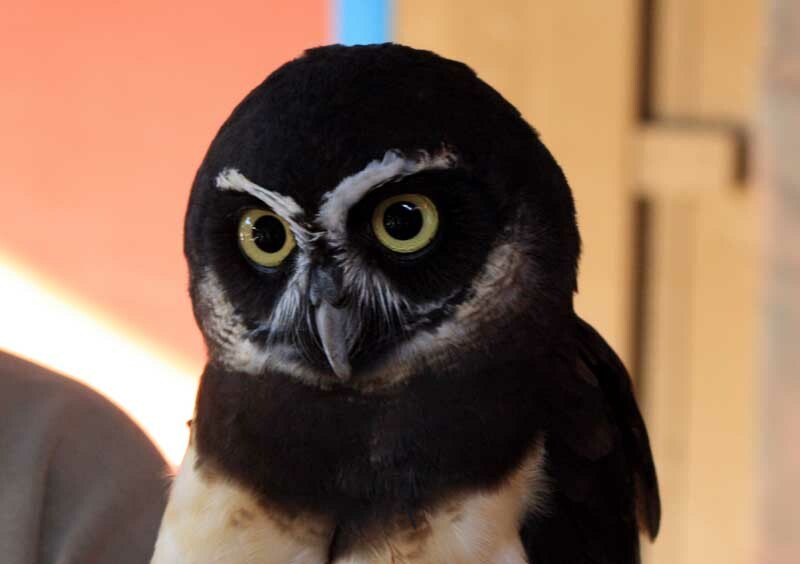 Out side the center, next to the petting zoo, two cast members had a Screech Owl and a Spectacled Owl out. We talked with them for a while and took some nice photos. We skipped the petting zoo and took the train back out. We were hungry but many of the food concession stands were packed. We decided on Tamu Tamu Refreshments since the line was short. We split the Slow Roasted Pulled Beef Sandwich - spicy beef with a mint yogurt cucumber sauce on a pita, served with fresh chips or apple slices. We sat in the secluded sitting area out back. I really liked the sandwich. Kelli was not a fan of the cucumbers but enjoyed the spicy beef. 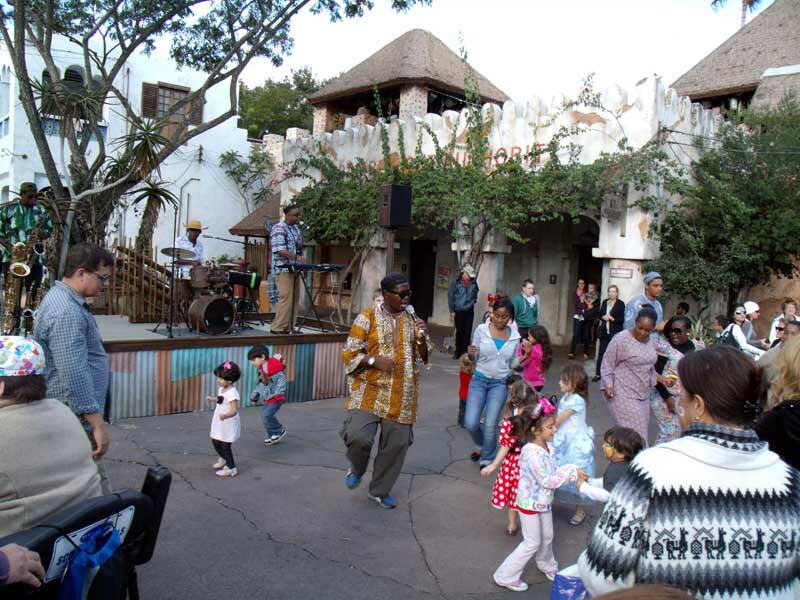 Next we watched and listen to the African Village Band. They even did a version of the Electric Slide and had a crowd dancing in the plaza. 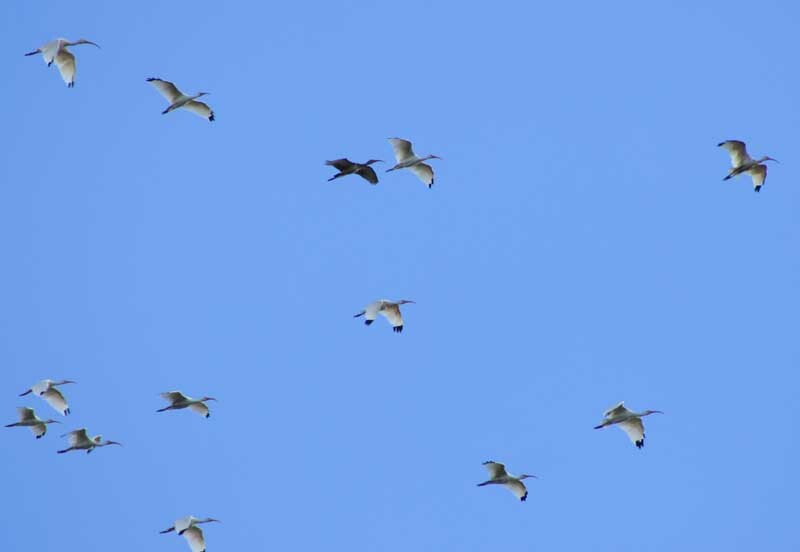 On the way out hundreds of White Ibis were flying around. Back at the resort it was too cold for swimming. We rested in the room and out on the balcony. We even spotted a Bald Eagle soaring in the sky. We walked to Downtown Disney. Kelli said she really likes this aspect to the resort. Along the way Kelli spots a Limpkin, a type of bird that is only seen in the US in Florida. With that lucky sighting we made our way to Raglan Road Irish Pub and Restaurant. 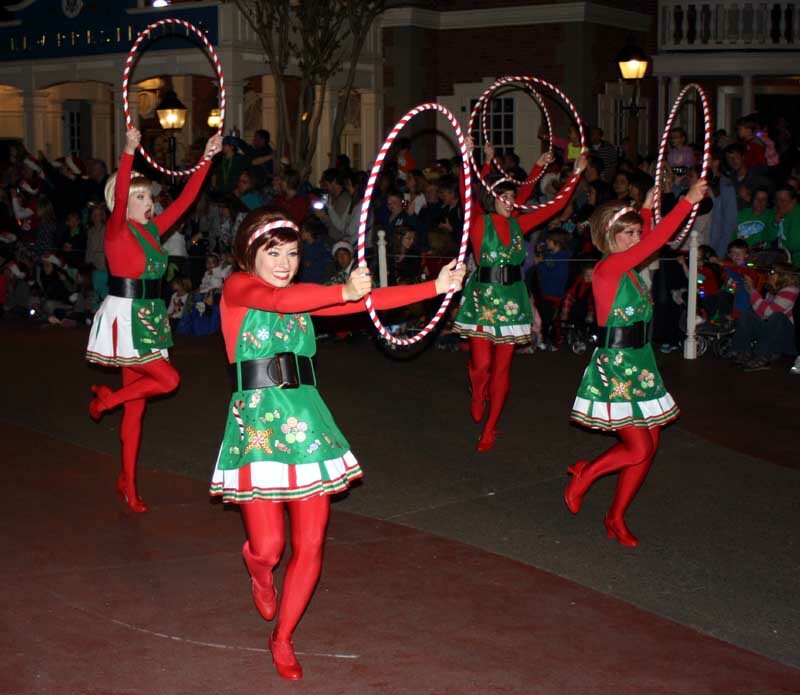 The Irish Dancers were teaching kids to dance in the square outside the restaurant. Later they danced on a stage in the outdoor seating area. We had a very short wait for a table and I started with a Guinness and we shared the Colcannon Soup. I had the Pork Vienna - Breaded and seared pork schnitzel with fried egg and chips. Kelli ordered the Burger 'R' Way - Char grilled sirloin beef burger with bacon, tomato chutney, and Dubliner vintage cheddar. We were also able to enjoy the dancers when they performed inside the restaurant. The food was great as always but we couldn’t finish the meal. We took the rest with us: it’s nice to have a refrigerator and microwave back at the studio for leftovers! We did split the Strawberry & Apple Crumble - fresh strawberries and apples in a tart with berry compote and vanilla bean ice cream. We shopped Downtown Disney for a while and we listened to the classical band when we heard them playing Canon in D Major; the music that my wife walked down the aisle to. It’s strange but we seem to keep running into this song while at Disney. Maybe it’s a sign that we were all meant to be together, me, Kelli, and Disney. Kelli designed a few T-shirts for herself and for some gifts back home in the Disney's Design-a-Tee Shop before we headed back for the night. 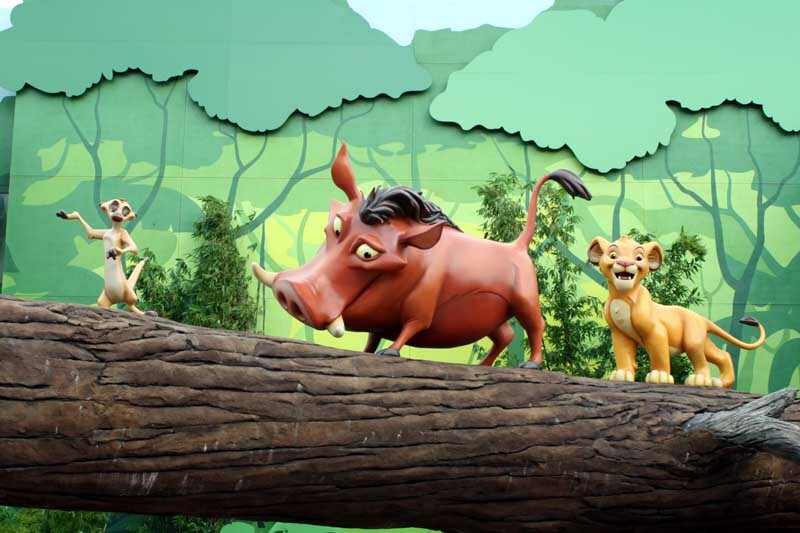 Comments: Enjoying Animal Kingdom’s wildlife in a leisurely manner without it being hot and humid was an unexpected treat. 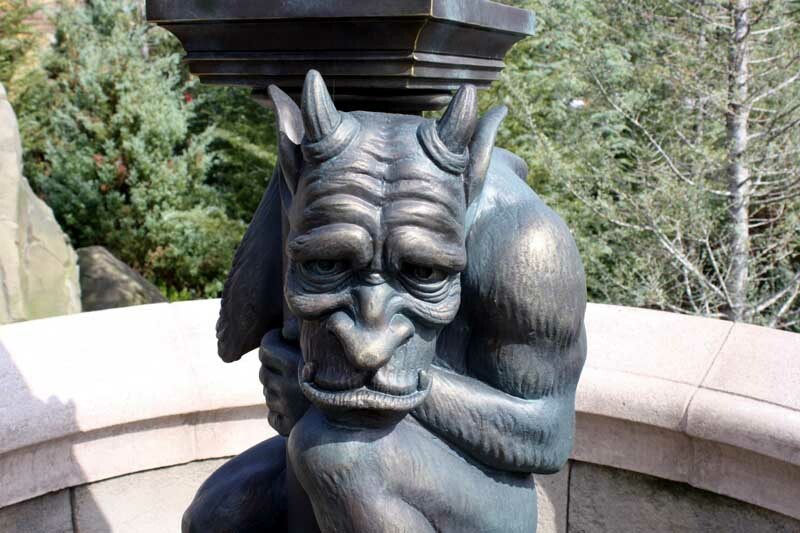 I think we have been to Raglan Road more times than any other Disney restaurant. We knew the end of our vacation was drawing near, as the park storming urge was getting to us a bit so we got to Epcot minutes after opening. 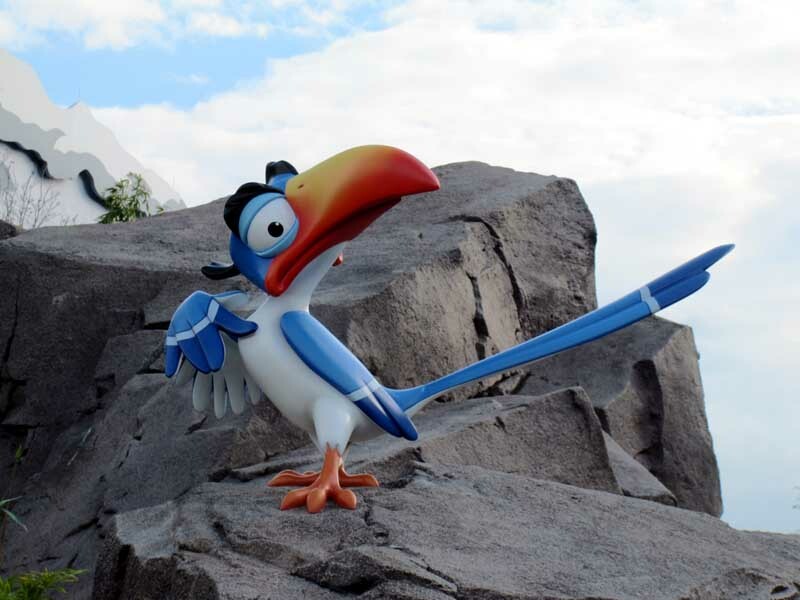 We headed to the Land pavilion, grabbed Soarin’ fast passes and got in line. The wait said 30 minutes but we were in the preshow area in fifteen. We got center front and were soon enjoying the sights, sounds and smells while soaring over California. We did Living with the Land with a moderate wait and got our own row. Our fast passes were due so we rode Soarin’ again. 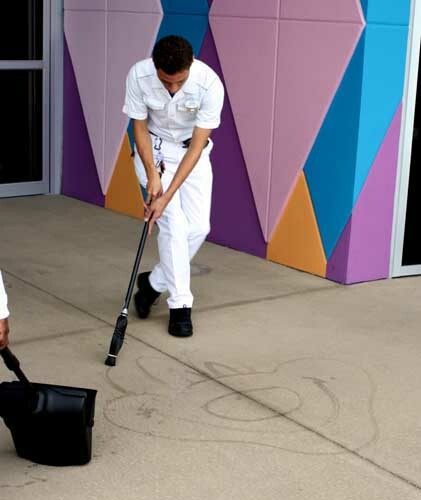 Next was Journey Into Imagination With Figment, a favorite of ours. After the attraction we made our own figment and e-mailed them to ourselves. The Food and Wine had just opened and we made our way to France. We loved the Créme Brûlée au Chocolat au Lait so much we had to have it again, and not share! We each slowly enjoyed our own. Next up was New Zealand for the Seared Sea Scallop with Kumara Red Curry Puree and Apple Radish Salad and the Lamb Meatball with Spicy Tomato Chutney. Both were good. Kelli next wanted to shop in Japan in the Mitsukoshi Department Store. I decided to try the Sukiyaki Beef Pan (Marinated Thinly Sliced Rib Eye with Sautéed Onions and Teriyaki Sauce Served in a Bun) before I joined her. It was OK but it wasn’t what I was hoping for. When we passed the American pavilion I remembered that we wanted to try the 17th Anniversary Festival Beer from Sam Adams. We shared a 12 oz glass from the Hops and Barley booth of the Samuel Adams Chocolate Bock. It was a great beer. The Spirit of America Fife and Drum Corps was playing and we listened to them finish their performance. Kelli remembered that there was another set of cheeses she wanted to try. 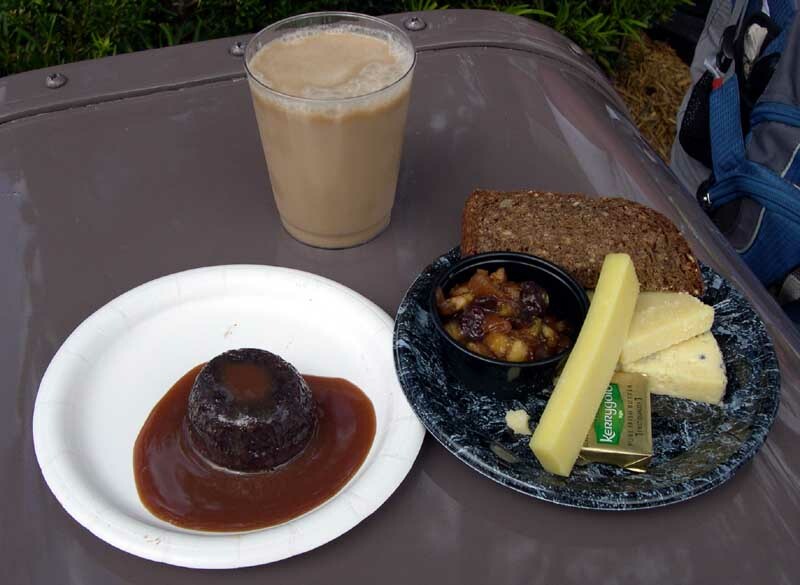 We had tried the Irish cheeses a few days earlier. We found it at the appropriately named booth Cheese. The sampler was Trio of Artisan Cheeses: Beecher’s Flagship Reserve Cheddar, La Bonne Vie Goat Brie and Rogue River Creamery Echo Mountain Blue Cheese. All were good but a little strong for me at the time. Kelli gladly finished the rest. 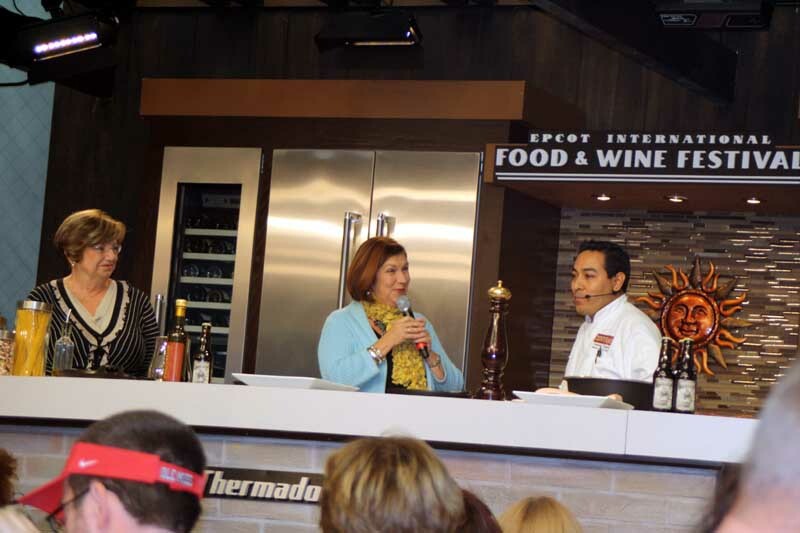 The 1 PM Culinary Demonstration presenters were Cristobal Lopez from Portobello, the Downtown Disney restaurant and Sally Schweiger from Schweiger Vineyards (Saint Helena, California). The demo featured a braised pork belly with warm lentil salad paired with a Schweiger Vineyards Merlot (Saint Helena, California). The wine was a big treat. I lost my notes but I believe it was from the 80’s and goes for about $80 a bottle. Cristobal was not a great presenter but the sample of wine and food made up for it. We headed back to the resort to get some more pool time in. Dinner was at our favorite restaurant Artist Point at 6:15 PM. 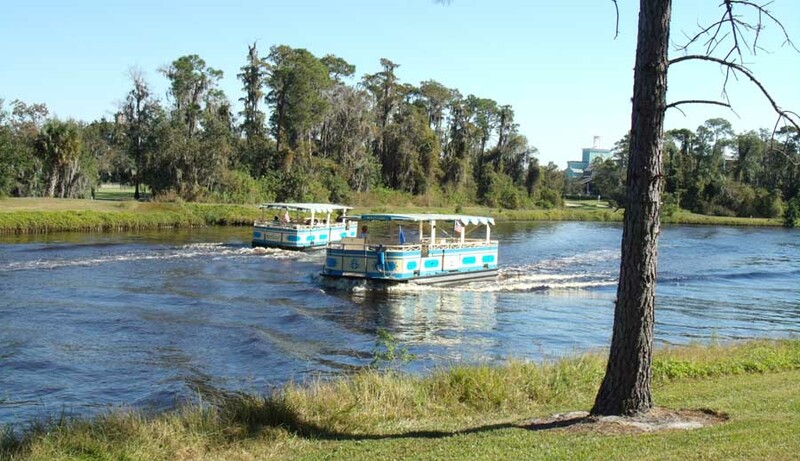 We drove over to the Wilderness Lodge, taking the back roads from Saratoga Springs. We reluctantly skipped the appetizers, especially their mushroom soup. The food and wine festival is feeding us too well. 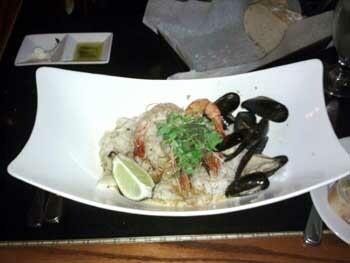 I had the Wild Caught Prawn and Crab "Hot-Pot" - with mussels, crispy pork, jasmine rice, and spiced Thai Coconut Broth. 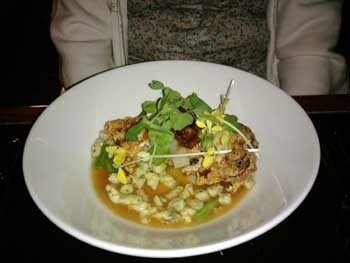 Kelli had the Crispy Buttermilk-dipped Airline Chicken - with Herb Spaetzle, Roasted Brussel Sprouts, Bacon Jam, and Garlic Tomato Broth. While waiting for the entrée’s our server brought out a free sample of their delicious Smokey Portobello Soup - with Roasted Shiitakes, Chive Oil. It was great as usual but small enough not to fill us. The entrées were excellent but Kelli said that we should do our favorite restaurant early in our future trips. 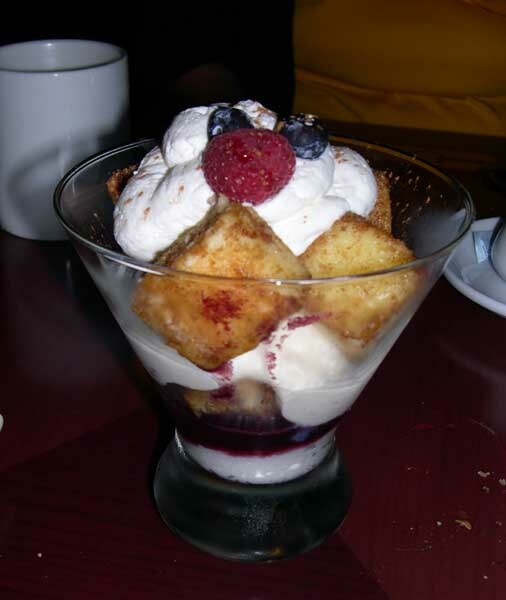 We want to be hungry for this restaurant so we can enjoy appetizers to desserts. 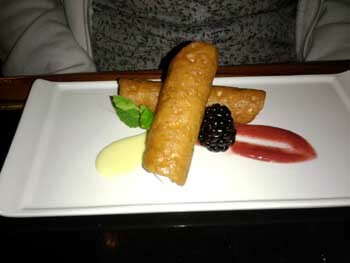 We were full but I just had to have the Artist Point Cobbler - Seasonal berries and housemade ice cream and Kelli ordered the Local Orange Blossom Lace Cannoli with Mountain Berry Mousse, white chocolate anglaise, strawberry rhubarb jam and micro basil. Both were good but their cannoli was different than what we are used too. We are from NY and you can’t compete against a good NY/NJ cannoli ( Don’t forget; around here its "Leave the Gun - take the Cannoli"). Comments: It was good to get on some rides today. I think all this good food is taking it toll. 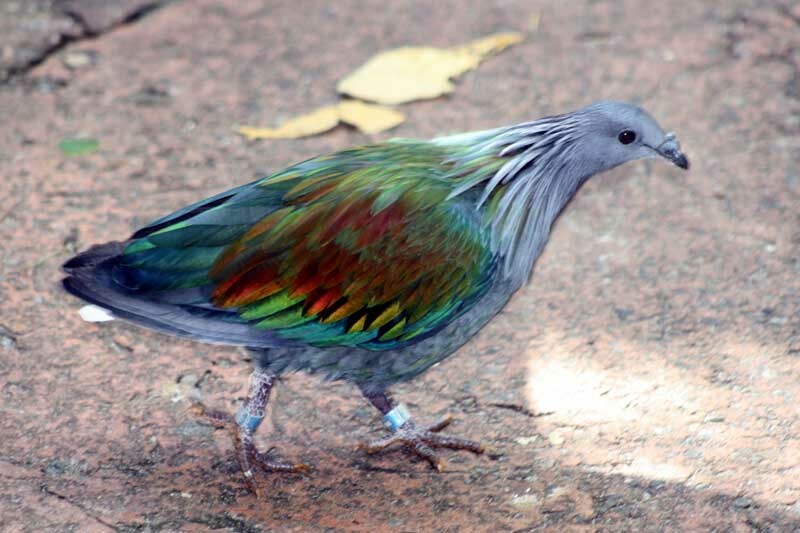 I was again up early and wanted to hit the Animal Kingdom for early entry. Kelli gladly slept in. I also had to go back to Epcot to buy a couple of items at the Food & Wine pavilion for our nephews who drove us to, and will be driving us back from the airports. 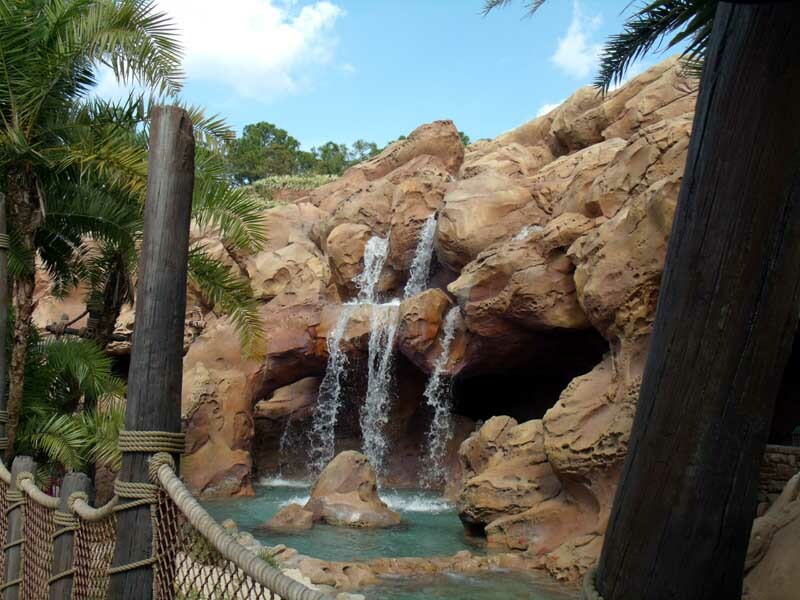 I arrived at Animal Kingdom at opening and made my way to Everest, but it was down. I decided to take a spin on Primeval Whirl. After that I checked on Everest but it was still down so I left and headed for Epcot. 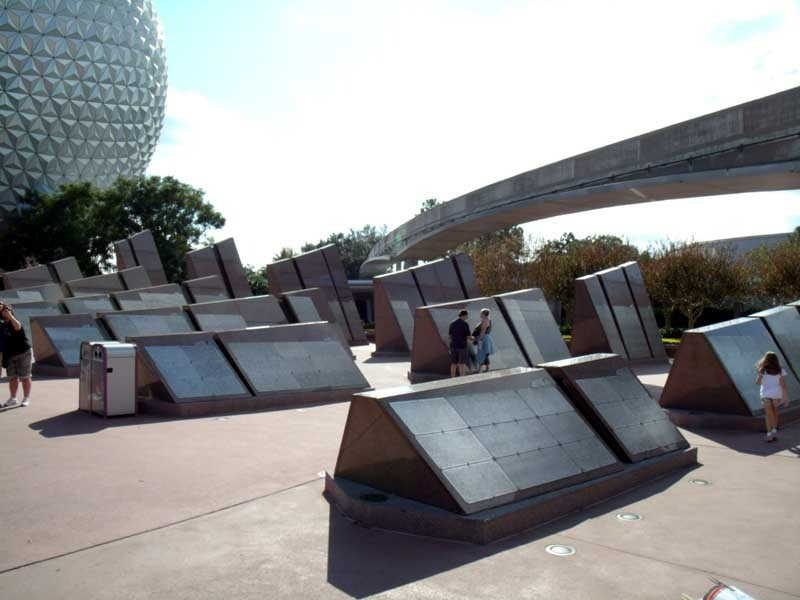 Once I got to the entrance I knew I needed a rest so I hopped on Spaceship Earth. I was alone and wondered what they would do at the video at the end. I thought it might be an empty space for the face; but I was paired with a lovely blonde cartoon girl. Next was Mission: SPACE orange side and had a great ride. I stopped at the festival pavilion and got these cool tequila bottles shaped like skulls. 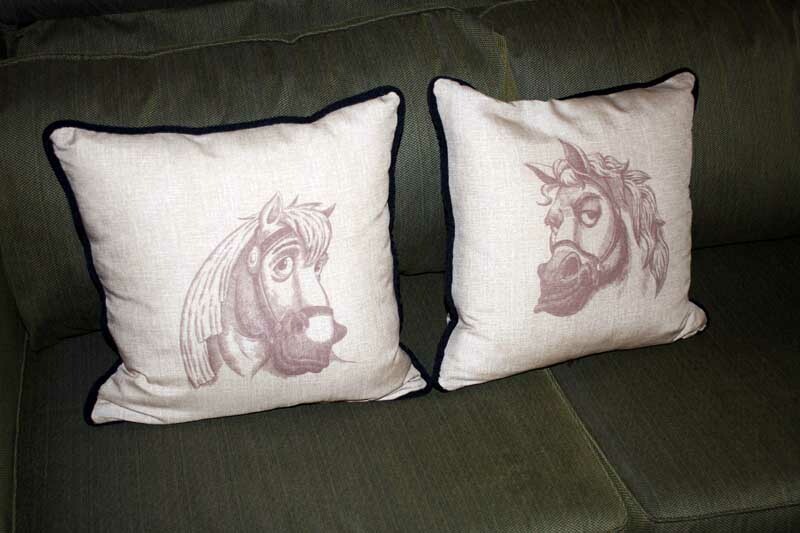 I know my nephews will like them as much as I do. When I got back Kelli was going to head to downtown to shop. I needed to rest so I’ll meet her for lunch later. After a good short nap I called Kelli. We will meet at Ghirardelli Ice Cream & Chocolate Shop for lunch. 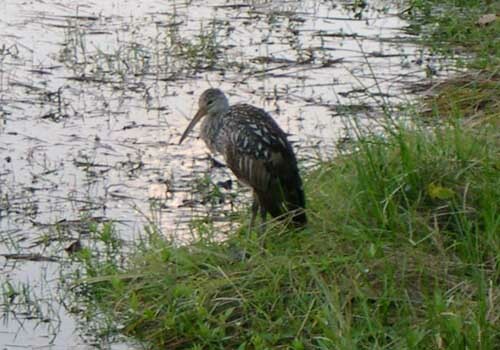 She also mentioned she had seen the Limpkin along the lake shore again. On my walk to downtown I ran across a British couple looking into the trees. They had an Osprey perched. I told them about the Limpkin. They thanked me but said they already seen it. I met with Kelli and we had ice cream for lunch. She had two scoops, chocolate and vanilla with dark fudge and peanut butter sauces. 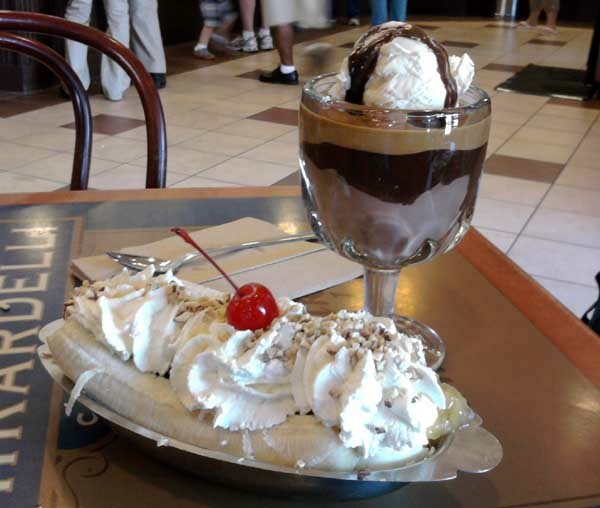 I had the Banana Split. The Festival of the Masters was happening in downtown and it was surprisingly crowded. We did not bother to look around anymore but we did stop in the D Street shop and saw an artist drawing Carl Fredricksen from the movie UP! On the walk back Kelli mentioned she had seen an Osprey too and that she also met the British birders and told them where to find the Limpkin. 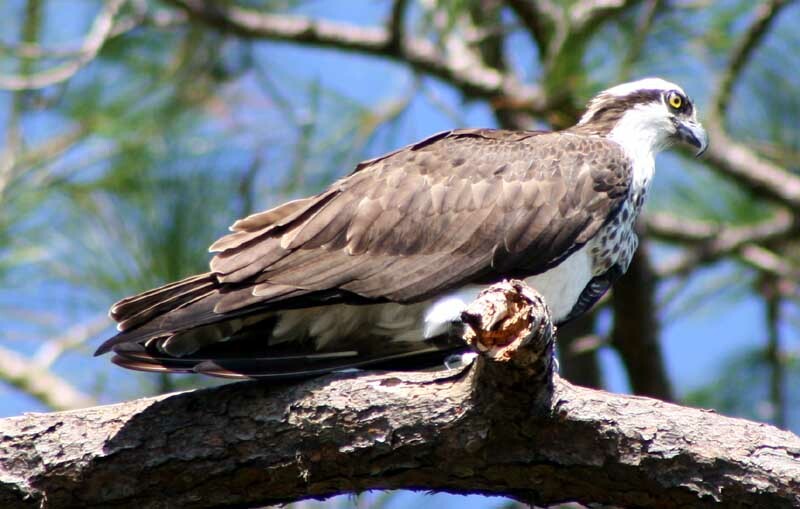 The Osprey was still there and we got some photos of him. I made an ADR for the Wave tonight then we hit the pool for a couple of hours one last time. In the room we were a little hungry so I heated up our leftovers in the microwave. I tried to recreate the egg on top of the pork, but I forgot even a yolk out of its shell will explode in the microwave. After cleanup the leftovers were as good as the first time. Since we would be busy tonight; we needed to start to pack. We had purchased a lot of stuff, early Christmas shopping and we were glad to have brought two large suitcases. Now we had to hope we did not go over 50 lbs on them. I also went on line to pay our Delta baggage fees. We sat on the balcony one last time till we had to leave for dinner. We drove over to the Contemporary but we were not feeling hungry so we decided to cancel the reservation and go into the Magic Kingdom early for Mickey’s Very Merry Christmas Party. We had to stop at Will Call for our tickets since we got a discount through DVC and they had to check our DVC ID. After entering we took some picture in the square, then went up to the train station to take some pictures. A friendly British chap saw me trying to use the poles and railing as a makeshift tripod. He called us over and he let me use his tripod to get some great night shots. 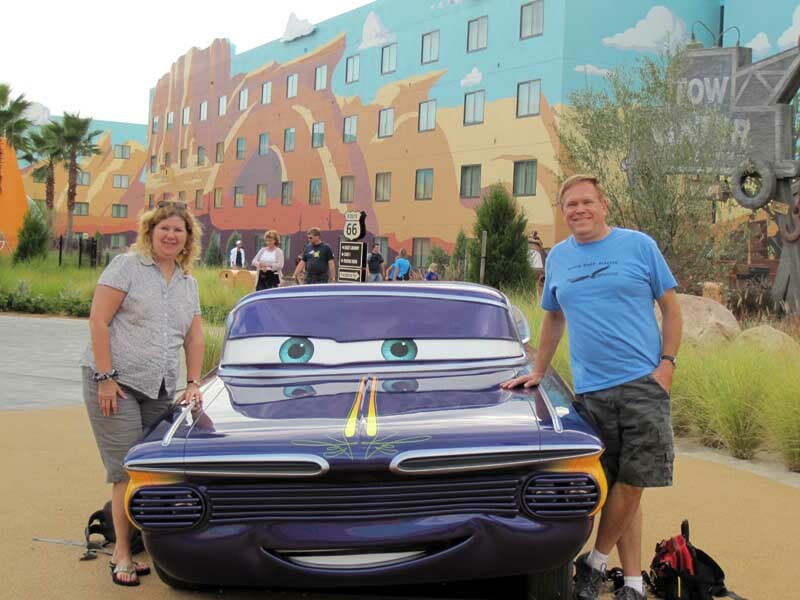 We took a spin around future world on the PeopleMover, and then did Buzz Light-year. We wanted a good spot for the parade and headed towards Liberty Square. 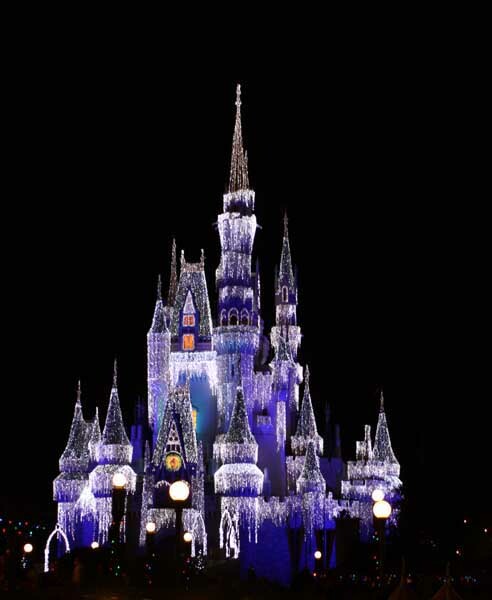 As we passed the castle we realized they were having the castle lighting and we waited till the end when they light up the castle in Dream Lights. 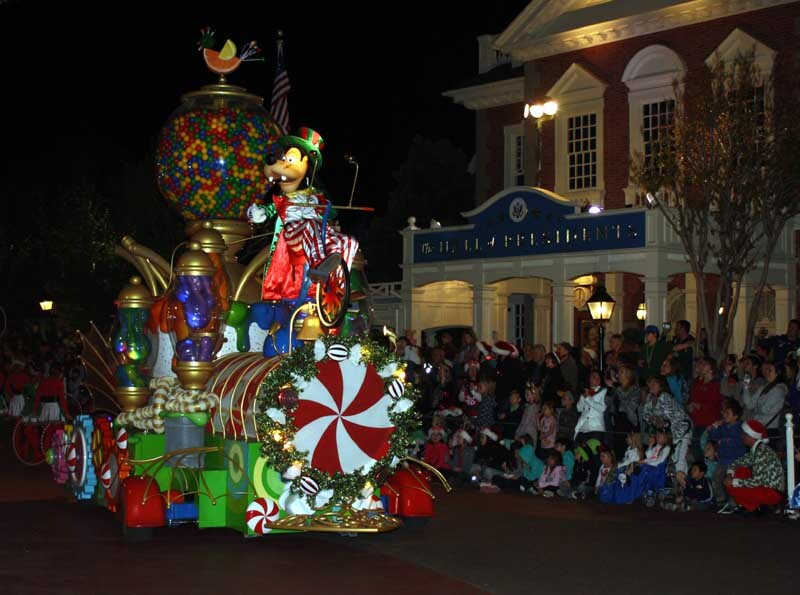 We continued on and found a spot outside Ye Olde Christmas Shoppe to view the parade. 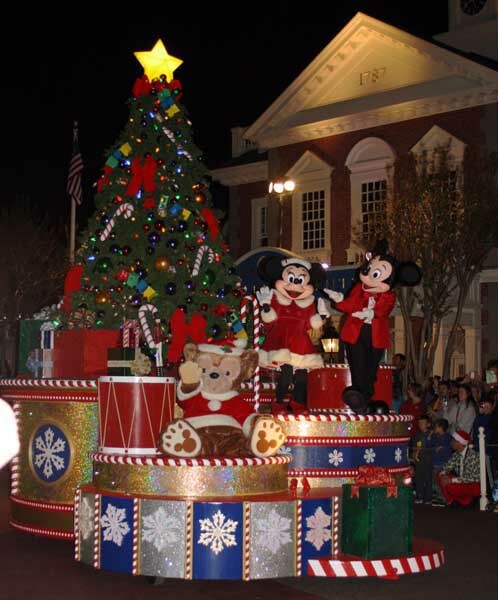 Mickey's Once Upon A Christmastime Parade was great as usual. We then tried for the free cookies and hot cocoa in the Crystal Palace but the line was out the door. 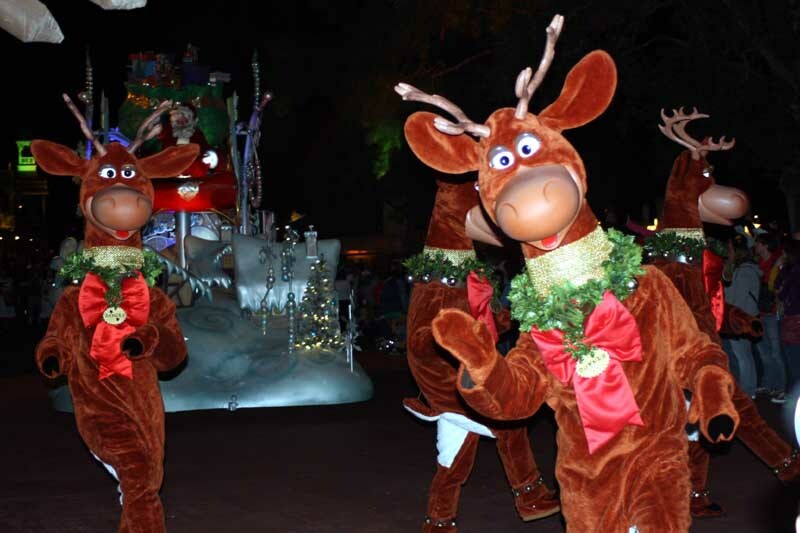 We continued on to Main Street for the fireworks, Holiday Wishes: Celebrate the Spirit of the Season and had no problem finding a spot in the middle of the street. Then it was off towards Tomorrowland and on the way we found chocolate chip cookies and thick, creamy hot cocoa at the Tomorrowland Terrace Restaurant with only a short wait. 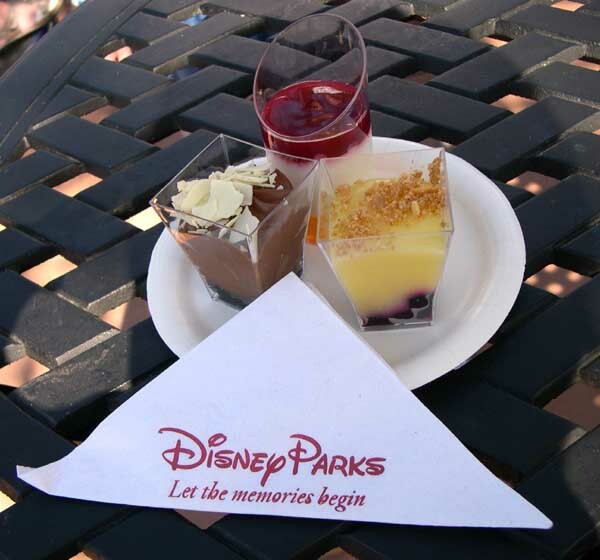 We sat down and relaxed on the terrace as we enjoyed the treats. 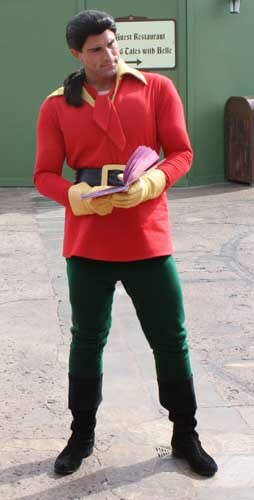 We then watched the last half of “A Totally Tomorrowland Christmas Show” on the Tomorrowland stage. It featured some great music, jokes, Buzz Lightyear, Stitch and Mike Wazowski from Monsters Inc. Watching Mike trying to dance around was the funniest part. 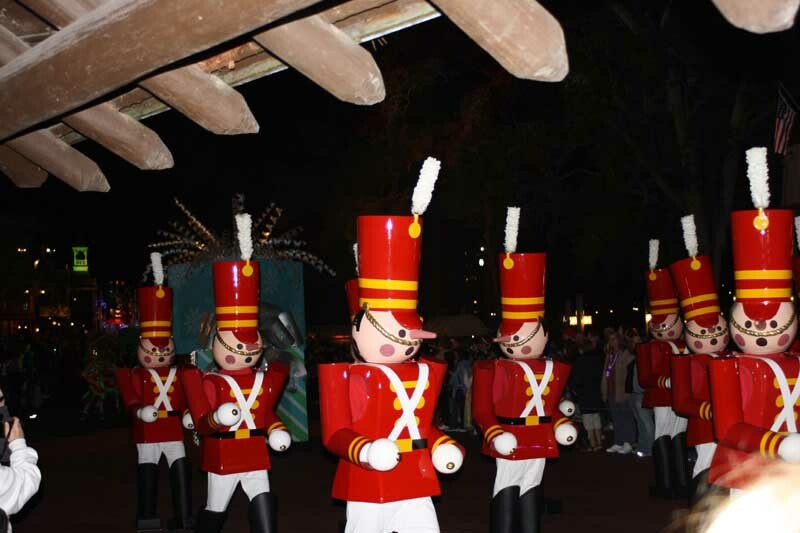 We crossed the kingdom back to the parade route and found the spot we saw the Halloween parade and again enjoyed Kelli’s favorites, the marching wooden soldiers. We hadn’t seen Mickey’s PhilharMagic this trip so we gladly sat and watch what I think is Disney’s best 3D film experience. 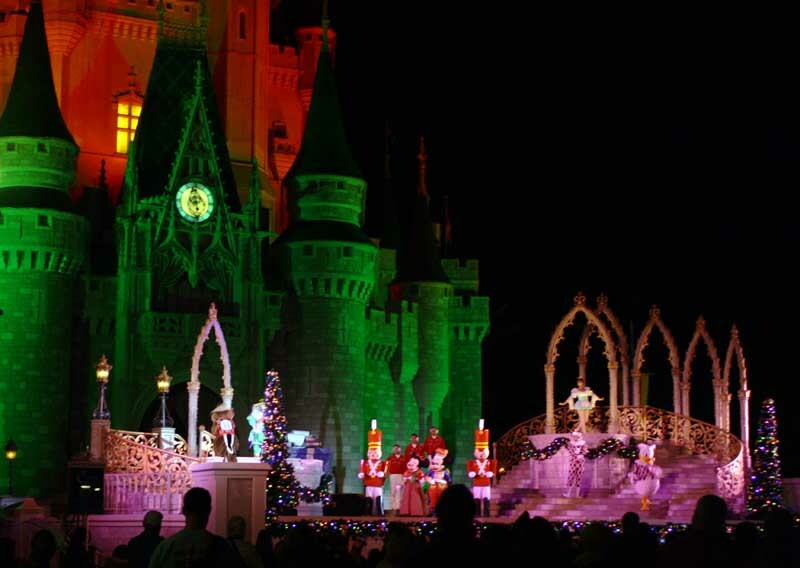 We started to head out but not before watching “Celebrate the Season” show on the Cinderella Castle Stage. At the finale they made it snow. We let the crowd disburse a bit then made our way down Main Street. 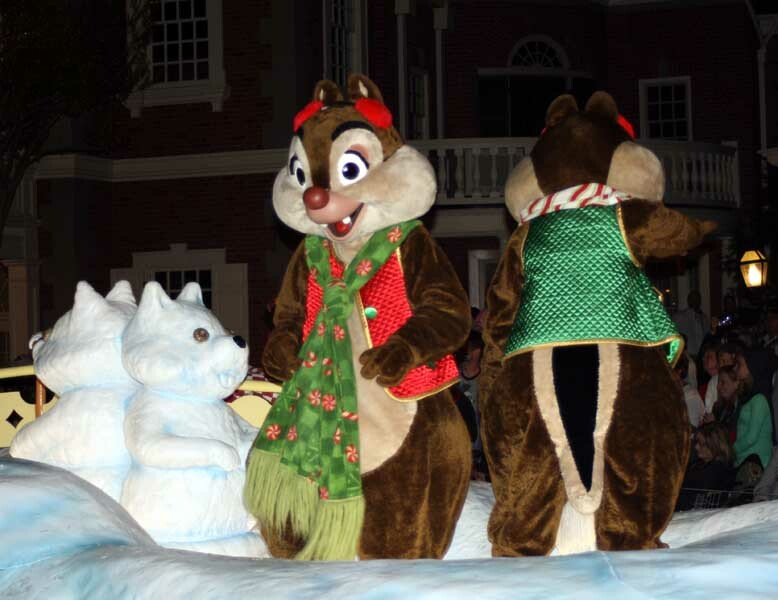 Disney also made it snow there as well. Comments: The Christmas party was a great way to end our last full day of vacation. It put us in a good mood looking forward to the holiday season. We got up early to finish our packing. Breakfast was on the balcony for one last time. To use the Resort Airline Check-In Service we had to check our luggage at the Carriage House at least three hours before our flight. Our large suitcases were under 50 lbs so no extra charge! For some unknown reason we had to go to concierge to print our boarding passes. We used the remaining time to explore the Tree Houses. We drive over to the Grandstand section and walked the path to the houses. 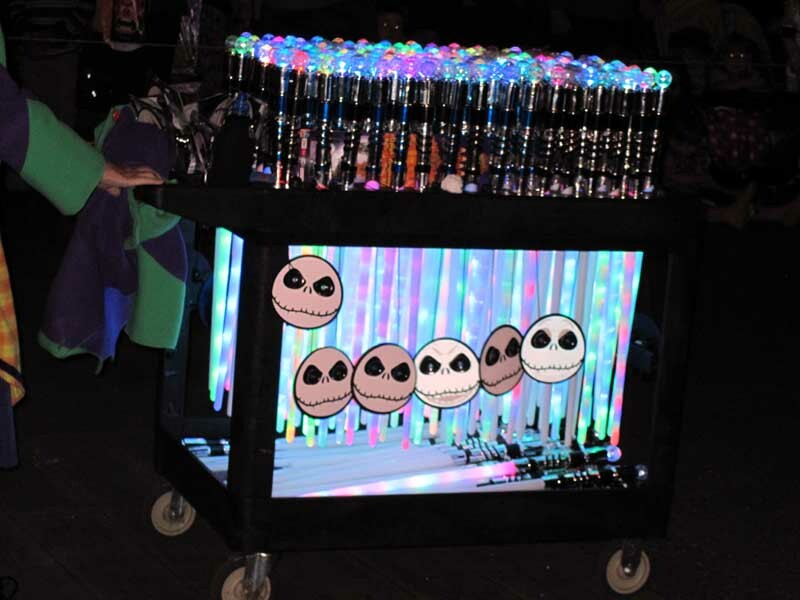 We can’t wait to try these next summer with family. I showed Kelli the pool, boat dock and even the nature displays along the paths showing the butterflies, birds and other wildlife found here. We took the service path over the waterway. If you turn left you can use this to walk to the Carriage House, just make another left to cross back over the water to the back entrance to the Artist Palette. If you turn right it leads to the Old Key West Resort. After our tour we headed to the airport and still arrived early. They opened up a new security line “for seasoned travelers, no families” and were only 3 and 4 in line. But an elderly gentleman was apparently clueless. He had to keep taking things out of his pockets to get through the metal detectors. He had to check his pockets FOUR times! We then had the most annoying flights on Delta. The first leg of the flight to Atlanta was uncomfortable. There was no leg room at all and this plane was heading to Düsseldorf, Germany after we got off! How any tall person can take this Delta flight overseas is beyond me. We deplaned in Atlanta at one far end of Terminal A and had to walk to the other far end to catch our connecting flight to New York. We almost had to check our carry-ons since there was no room in the overhead bins, but the stewardesses found a couple of spots in first class for them. Once at JFK we landed in Terminal 3 and called our nephew Mike that we had landed and to pick us up at that terminal. We followed the signs for baggage claim, and followed them some more. After a while I realized that we were now in terminal 4! Then, to get to baggage claim using an elevator we had to walk outside the terminal; go around a dark corner to an outside elevator, down one level and back into the terminal. Delta does not have their act together here and we plan on avoiding this airline, especially though JFK airport. We then had to call Mike who was now looking for us at the wrong terminal. At least the ride home was uneventful. Comments: The trip was one of our best ever. We were only on three attractions the first five days of vacation (three days in Disney) and having the best time! 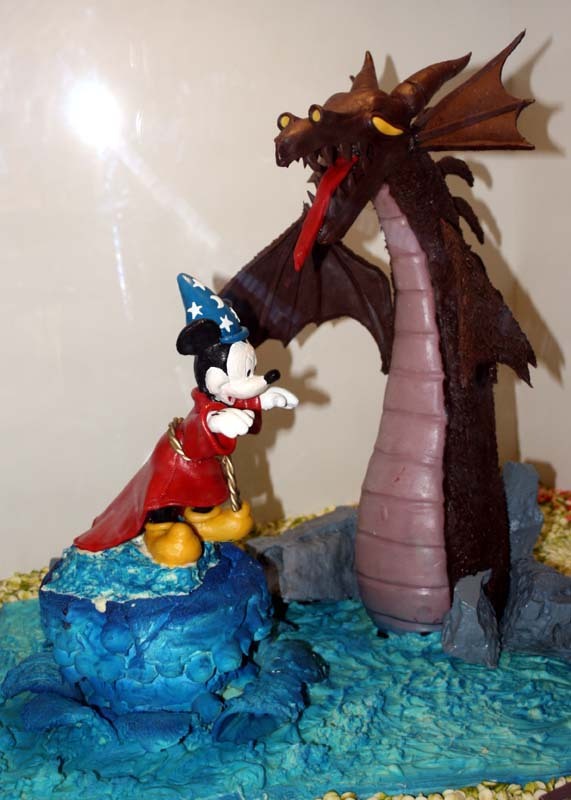 The Food and Wine Festival, the holiday parties, and touring new resorts and expanded Fantasyland made for one unique and different Disney vacation. 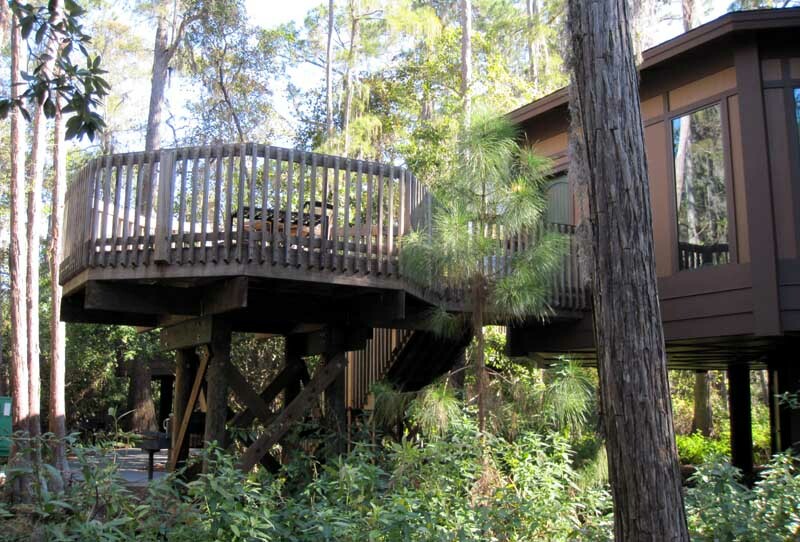 After looking around the Tree House Villas; we are even more excited to stay here. Getting away from New York after super storm Sandy was also a huge relief. We hope those the most affected by the storm recover quickly and their lives return to normal soon.